Kyoto shares a kind of peace with its visitors that immediately takes control over body and mind. It answers all your questions and makes you speechless. The city has two faces, the busy modern one of concrete, glass, metal, and noise, and then there’s the quiet side, when Japan’s old capital unfolds its true beauty. It’s not superficial, this beauty touched me deeply. You can see it, smell it, and taste it. Natural materials and clear lines create a compelling minimalist aesthetic dominated by dark wood and coal colored roofs shimmering silvery in the misty light. Silent stone gardens, temples, and shrines erase the noise in your head and fill it with serenity. If this feeling could manifest itself in a restaurant, this would be the wonderful Awomb. The restaurant is in an elegant traditional house, hard to find in a narrow side alley in old Kyoto. You sit on the floor, on Tatami mats made of rice straw, in front of a low wooden table. The room is filled with natural light, golden warm as honey. 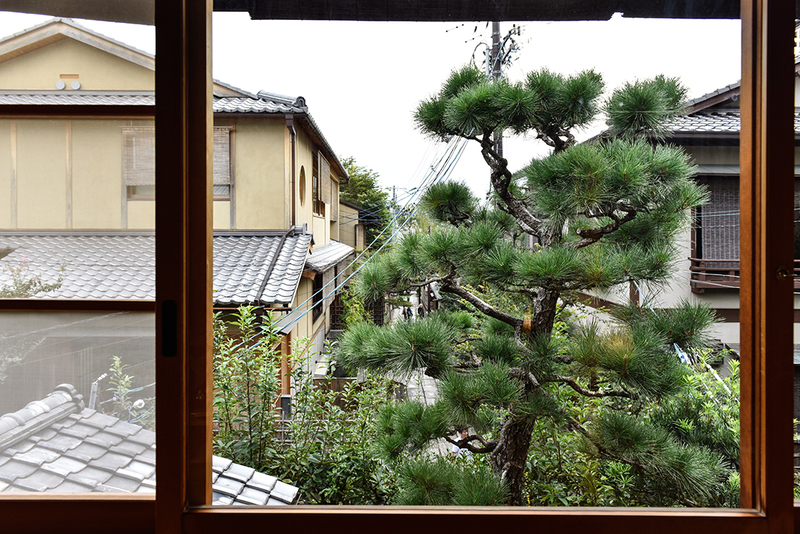 The subtle sound of the floors creaking and birds hiding in the tall pine tree in front of the window break the gentle melodies of the traditional Koto music playing in the background. It sounds a bit like a harp, melodic yet hard, pure as single water drops. The food created here is quite a new concept. 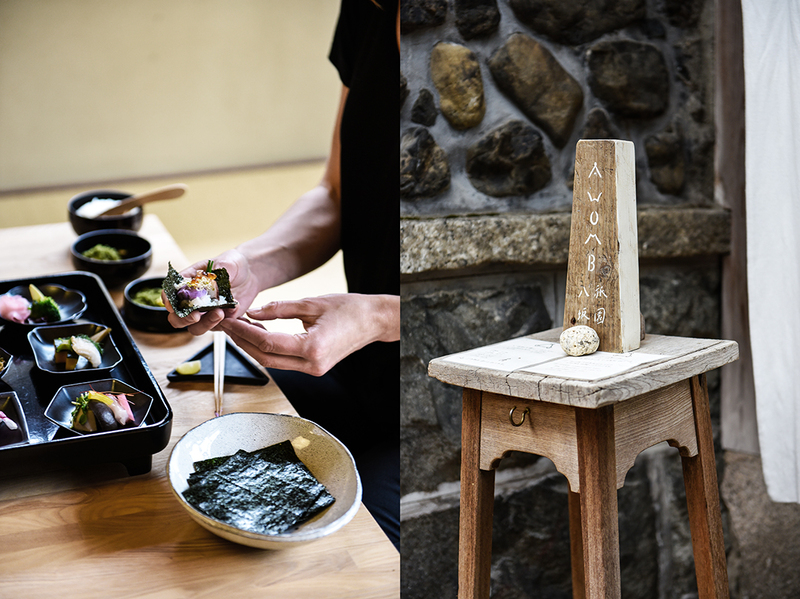 Owner Ujita Hiroshi brings hand-rolled sushi, which is usually served at home, to the restaurant table to share with friends. 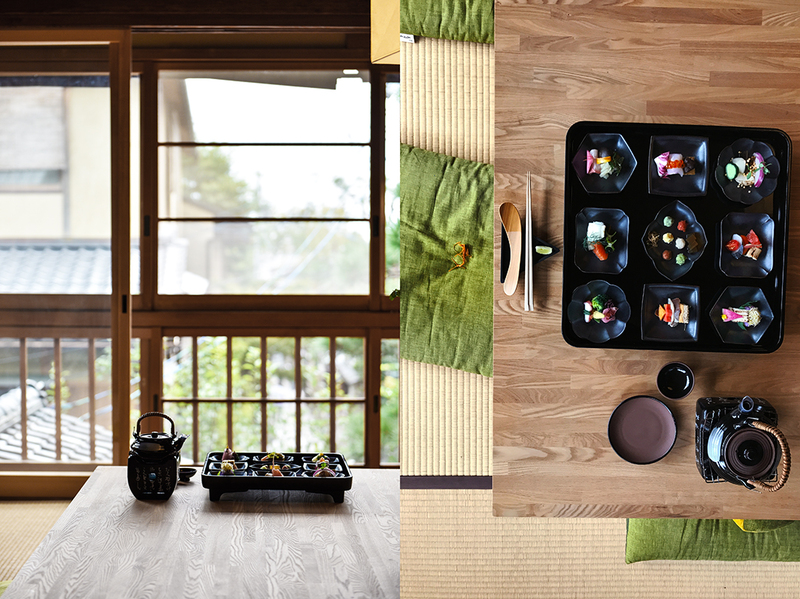 A bowl of white rice, a teapot filled with steaming dashi broth, and a black lacquered tray full of little plates filled with stunning delicacies are the center piece of this culinary experience: you come to Awomb to roll your own sushi in one of the prettiest rooms that I’ve seen on my trip. The food itself, each little plate, looks like a piece of art. 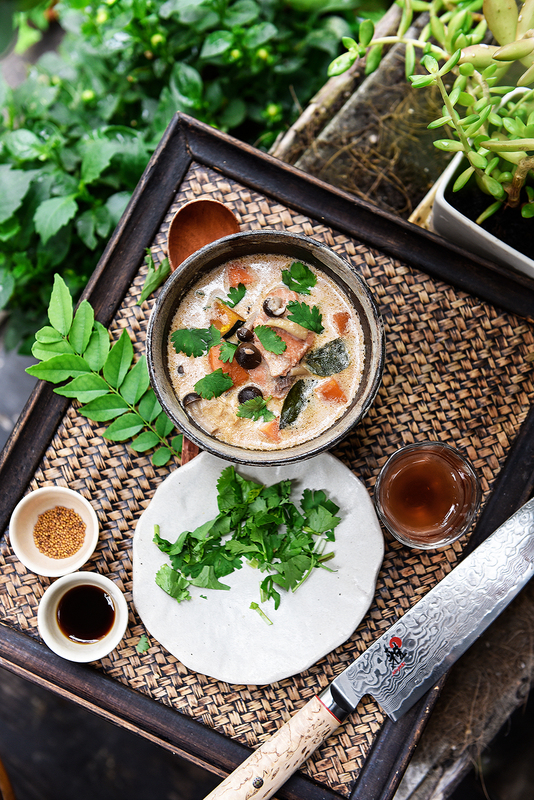 Seafood and vegetables can be mixed and combined according to your mood and refined with various seasonings, like fresh wasabi, grated ginger, plum sauce, salted vegetables, dried shrimp with mayonnaise, or tasty soy sauce jelly cubes. You can either add the ingredients to the rice bowl and eat it with chopsticks, or you can go for sushi in seaweed – rolled in your hands. 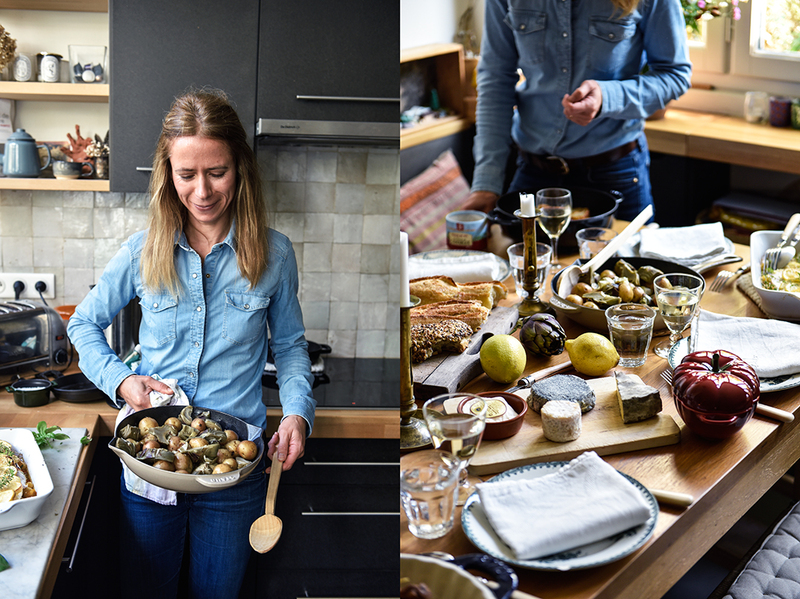 There’s no chance that I’ll ever have such a vast variety of ingredients to choose from in my own kitchen, but it’s so inspiring, I tried totally new combinations. I’ve learned that you shouldn’t be shy, just try not to use more than 4 to 5 main flavors and you’ll be rewarded with astonishing results. I got a bit excited and went overboard – the German girl came through – but my first “sushi in a bowl” made with pink grapefruit, salmon, fried sweet potato, square bean, gari (pickled ginger), and finely cut green matcha crepes tasted fantastic. Then I combined purple potato mash, octopus, and Ikura (salmon roe) and rolled it in seaweed, which turned into such a delicious beauty that I have to share this recipe with you. 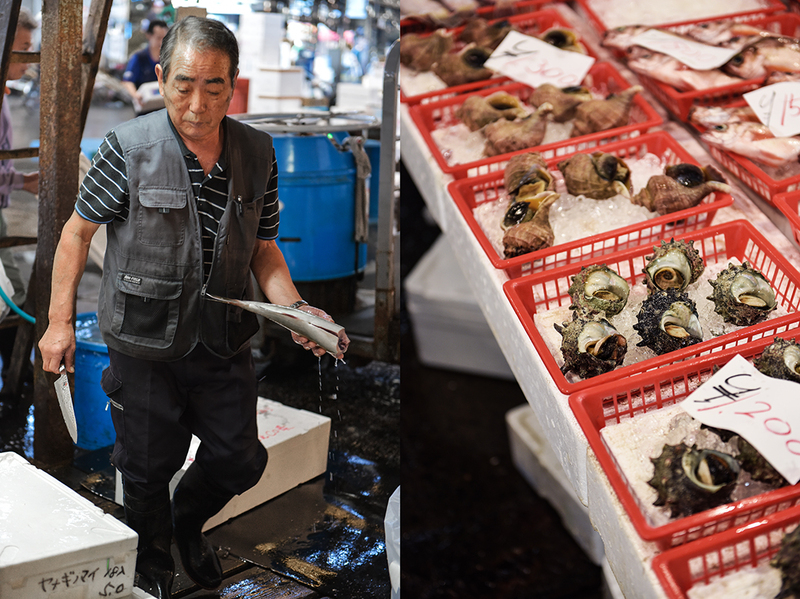 The quality of each ingredient used at Awomb is outstanding, which isn’t a surprise, Ujita Hiroshi comes from a family that has been in the sushi business for decades. However, the young man didn’t want to follow his parents’ footsteps, he decided to start his own food adventure. 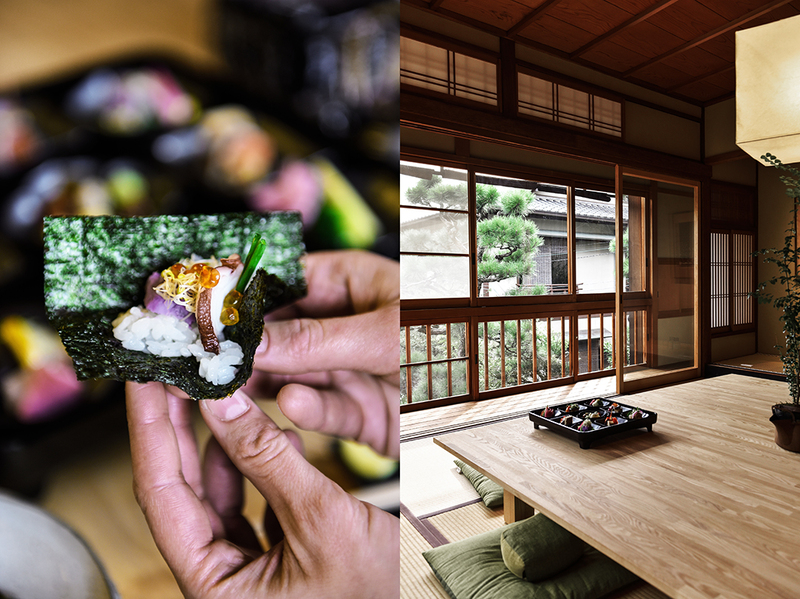 His vision, to make hand-rolled sushi a delicious and fun experience for friends outside their homes, is a huge success. 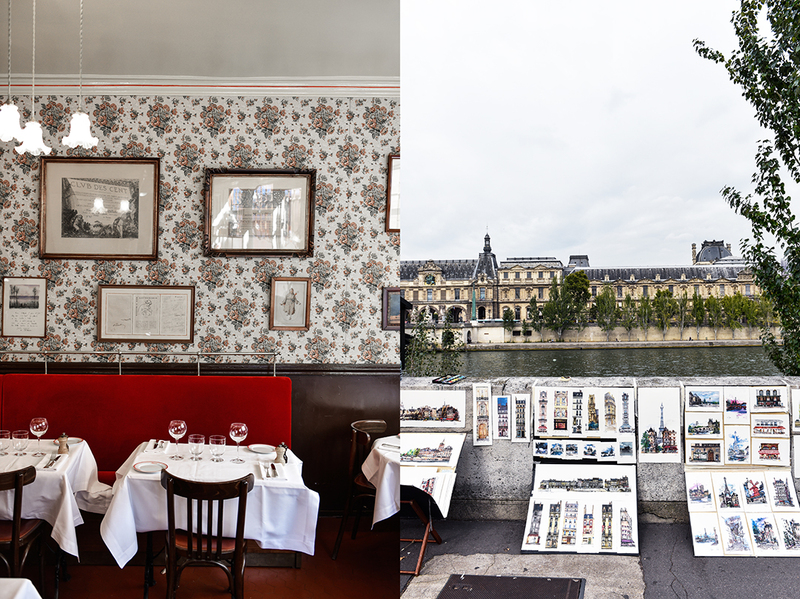 Long lines and waiting lists call for a well-planed reservation. For the mashed purple potatoes, purée the potato, heavy cream, and butter in a blender or food processor until smooth and season to taste with salt, pepper, and nutmeg. 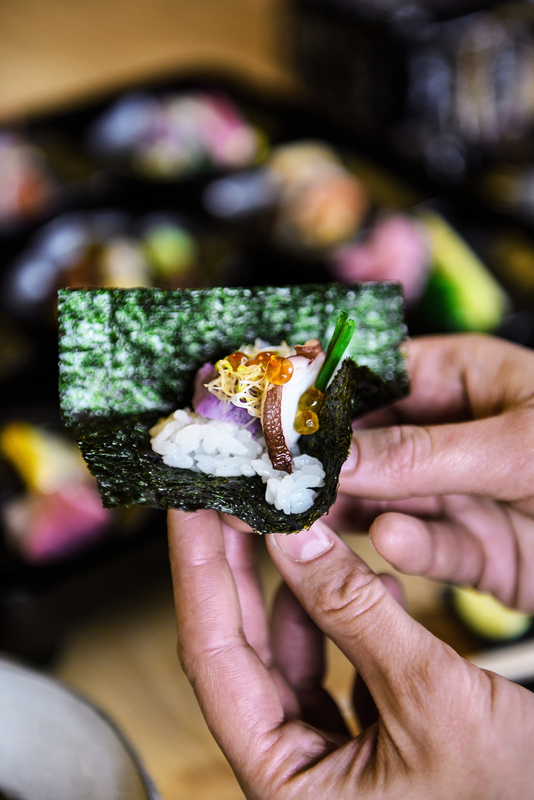 For the hand rolled sushi, place 1 tablespoon of sushi rice in the middle of a sheet of dried seaweed. Add 1 teaspoon of the mashed purple potatoes, a slice of octopus, and half a teaspoon of salmon roe. Roll like a cigar, add seasonings to taste, and enjoy. For the sushi in a bowl, add about 2 tablespoons of sushi rice to a small bowl and stir in seasonings to taste (add just a little bit). Add 1 grapefruit segment, 2 slices of salmon, 1 crumbled slice of fried sweet potato, 2 Edamame beans, and a little pickled ginger. Sprinkle with 1 teaspoon of the chopped matcha crêpe and enjoy! In a small bowl, heat the vinegar, mirin, sugar, and salt, over low heat, stirring until sugar and salt dissolve; let it cool. In a medium saucepan, bring the rice and water to a boil. Reduce the heat to low, cover the pot, and simmer the rice for 15 minutes. Take the pot off the heat and let it rest for 15 minutes, don’t lift the lid. Transfer the rice to a large glass bowl. Sprinkle the warm rice with the cold vinegar mixture and stir gently, you can fan the rice while mixing, that will help it to dry if it’s too sticky. Cover with a damp kitchen towel while you prepare the sushi. Sushi rice is best served at body temperature. 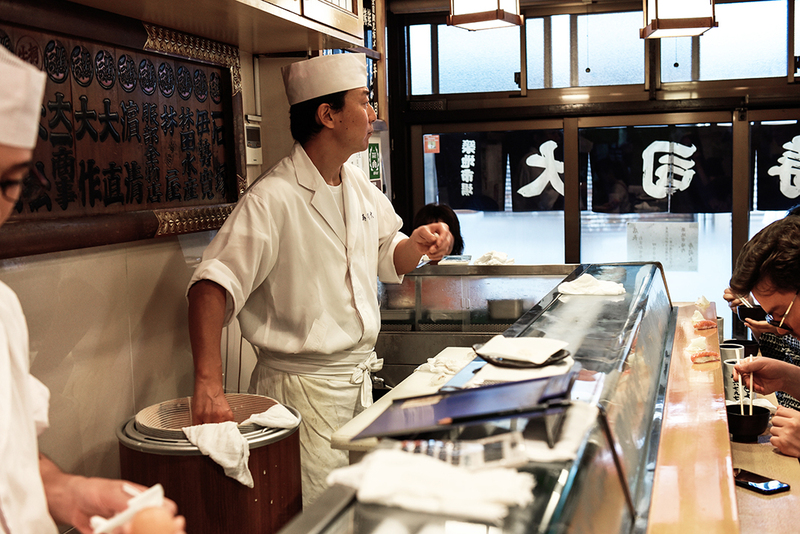 What inspired you to open a sushi restaurant? My parents ran a sushi restaurant that was very traditional but I wanted to do something different, something unique to me. I decided to focus on the idea of customers making their own sushi in an enjoyable way, and I started my own place. Is that popular in Japan? Hand rolled sushi (temakizushi) is popular now but it’s basically something that’s not eaten out. Everyone eats it with their families at home or at house parties. I thought that people would probably enjoy it if they could do something different and eat it at restaurants. Which ingredients do you serve for the sushi creations? 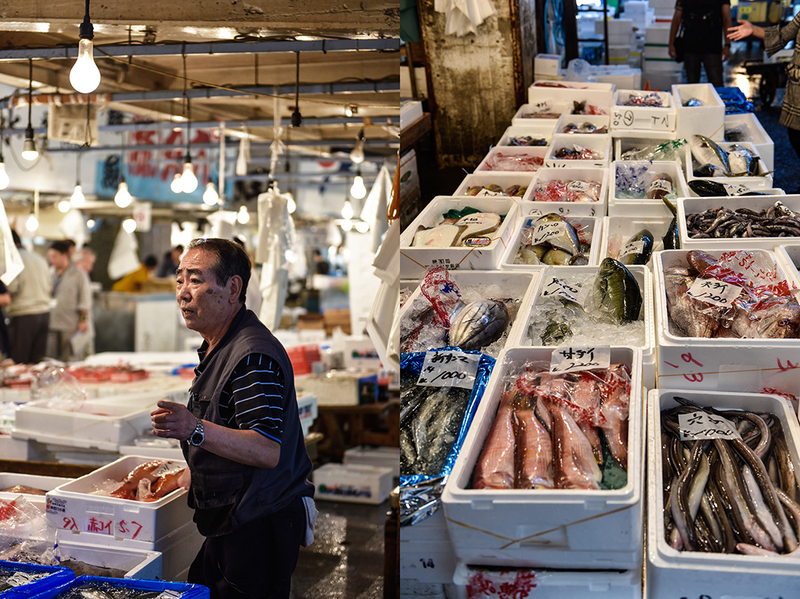 Please let me tell you about aezushi, it’s sushi that you mix and prepare yourself. 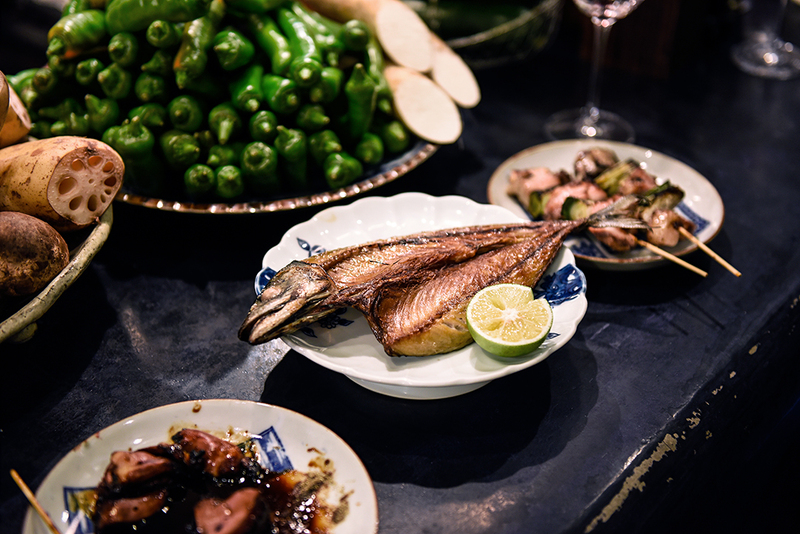 Firstly, we have vegetables and fish, we have sashimi – grilled conger eel – and turnip. There are vegetables from Kyoto that we often use, and this is yuba – a delicacy made from soybean milk. Further we have mackerel, which is served pickled in vinegar and Japanese scallop. Then we have shirae, a salad with white sesame, tofu, and white miso. We have aemono, which is vegetable, fish or shellfish dressed with miso, vinegar or sesame. Here is squid and fish roe. When you’re preparing the dish, you mix the seasoning with the other things and then eat it. We have lightly grilled skipjack tuna with deep fried tofu. Pickled ginger. Broccoli. There’s also octopus. Conger eel. Salmon. Pumpkin. Pak Choi and Kyoto taro root. And we also have the soup. I’ll light the flame, once smoke starts to come out, it’s done. Then you mix it with small boletus mushrooms and eat it. 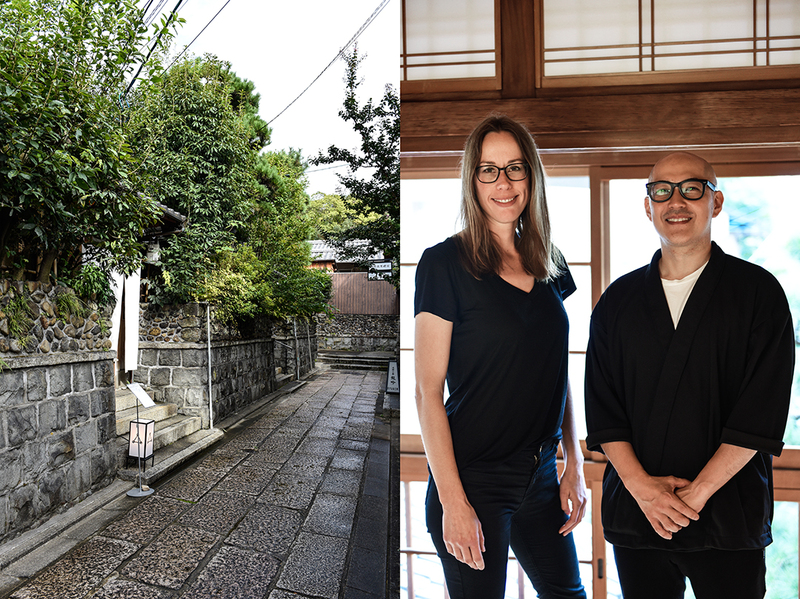 Eating at Taka‘s restaurant in Kyoto feels like having a Japanese feast celebrated with your exuberant Italian family. 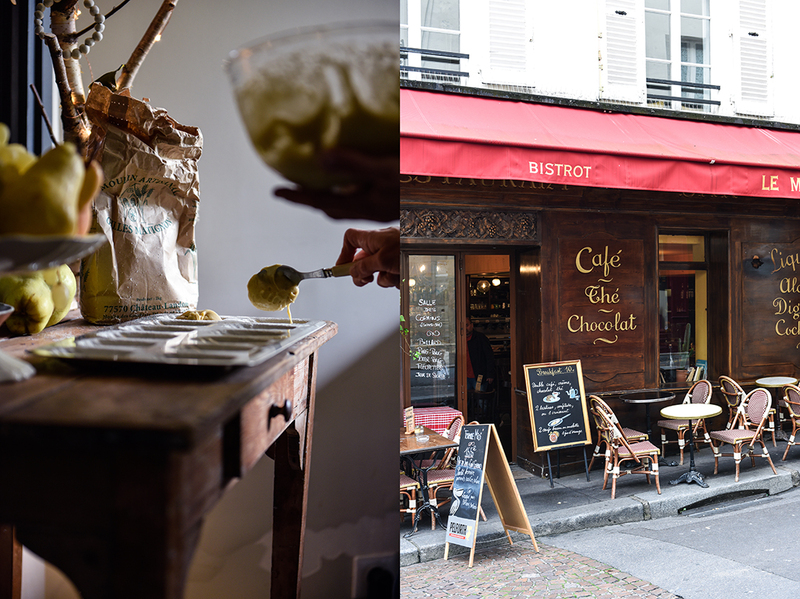 The place is tiny, it’s in a narrow old house tucked into a small secluded alley right in the old city’s busy heart. 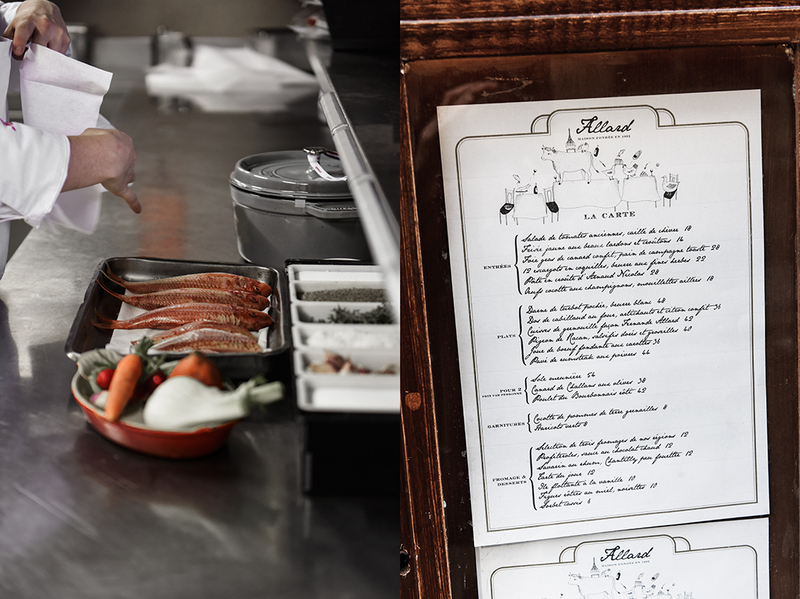 An L-shaped counter separates the celebrated chef from his hungry guests, however, there’s a lot of interaction going on. 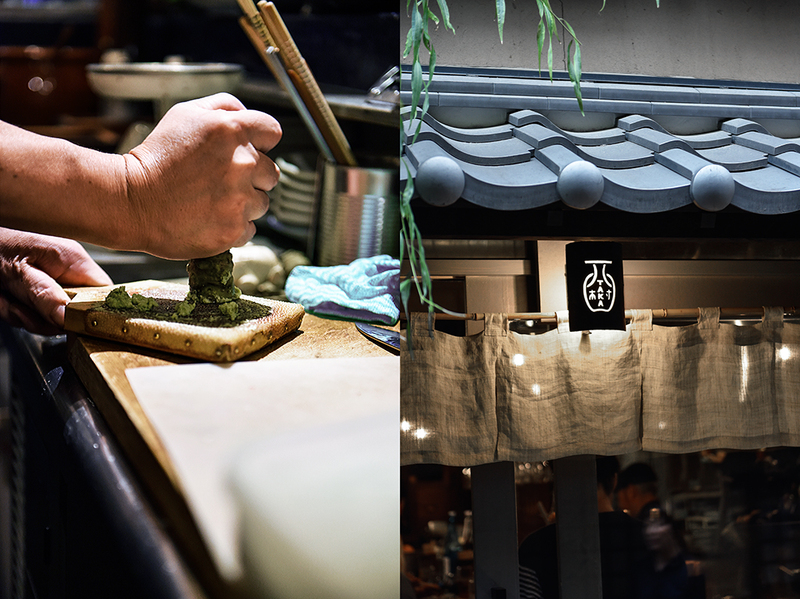 The kitchen is open so you can follow all of Chef Nishimura Takashi’s steps, how he grinds the fresh wasabi in smooth circles on a shark skin-covered wooden board (the only proper way to grind the green root as I’ve learned). The charming chef looks like a versed dancer. 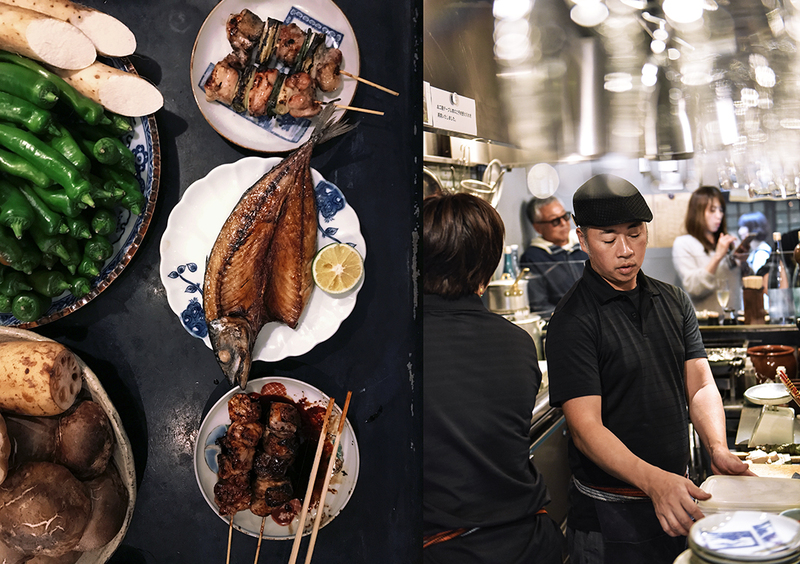 He quickly grabs pots and spices from the shelves behind him and then, in the next second, turns around to briefly cook tender chicken sashimi (see the recipe below) in the flames of his little grill; or local beef, or mackerel until it has a crispy golden crust all around. The restaurant’s menu is a revelation, sea urchin spinach and tempura lotus root sprinkled with matcha salt are simply divine. 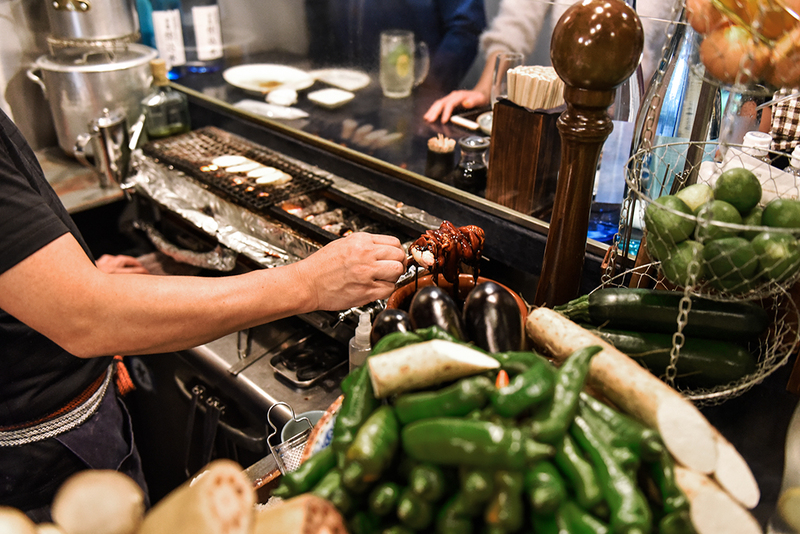 Sitting at the counter and enjoying Japanese tapas is a feast in its true meaning: You eat, drink, and share delicious treats with old and new friends. 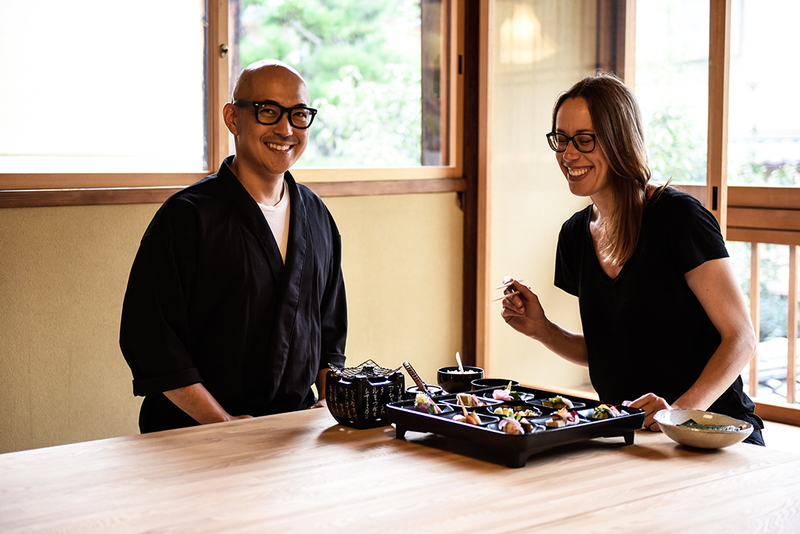 Kyoto born Chef Taka has lived and worked abroad for years, in Australia, Denmark, and in Italy, in Milan, where he also met his wife Akane. Before they opened their gastro pub in Kyoto, Taka worked at Armani’s Nobu Milano restaurant for 10 years, which explains why you can also find wonderful organic Tuscan wines and Mediterranean style dishes on the menu, like the fruitiest eggplant slowly cooked in an aromatic tomato sauce. 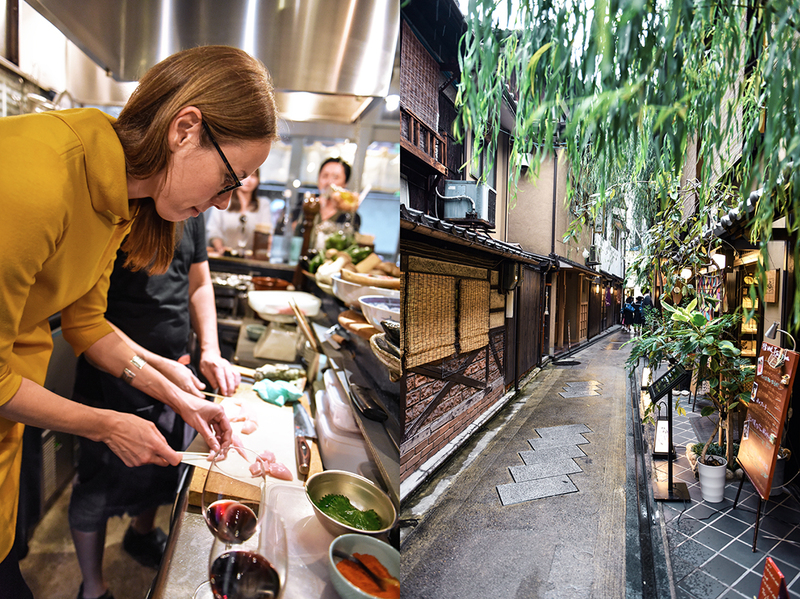 It’s the combination of these two worlds that makes the couple’s restaurant in Kyoto so exciting, yet at the same time it’s so relaxed. 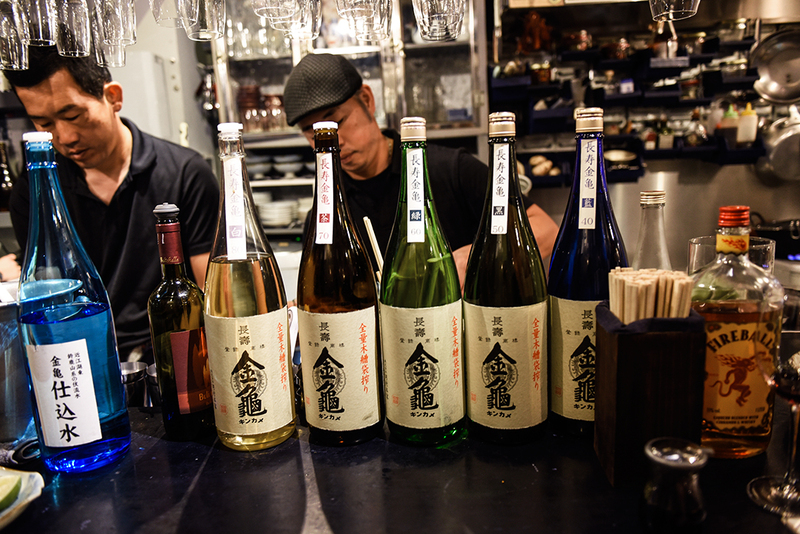 It’s the kind of place where you end up chatting with the guests sitting next to you, exchanging stories and dishes, saying Kanpai (cheers) with a glass of red wine in your hand or ending the night with an extensive sake tasting involving everyone in the room. 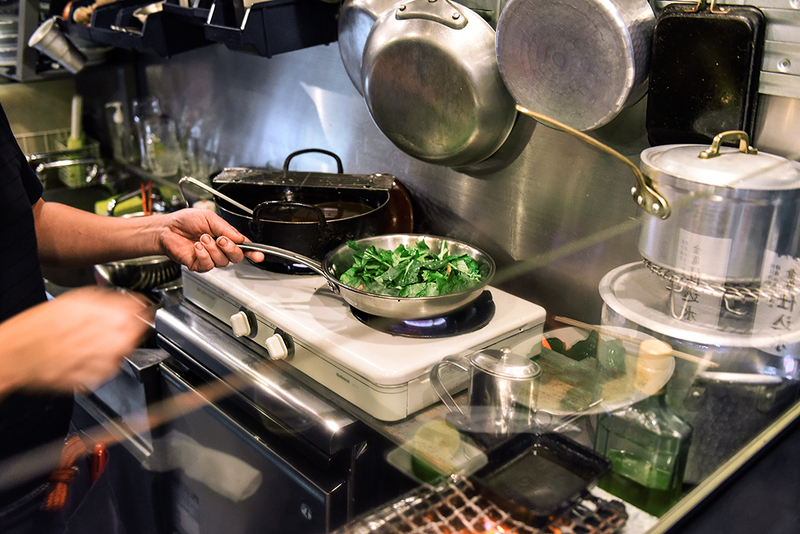 Taka and Akane love food and people, the people who visit them, their guests, and the people they work with, their kitchen team, but also the suppliers who deliver fresh produce and products of the best quality to this tiny kitchen in the heart of Kyoto. The couple knows all of them personally, they’ve been working with them for years, most of them coming from the area. 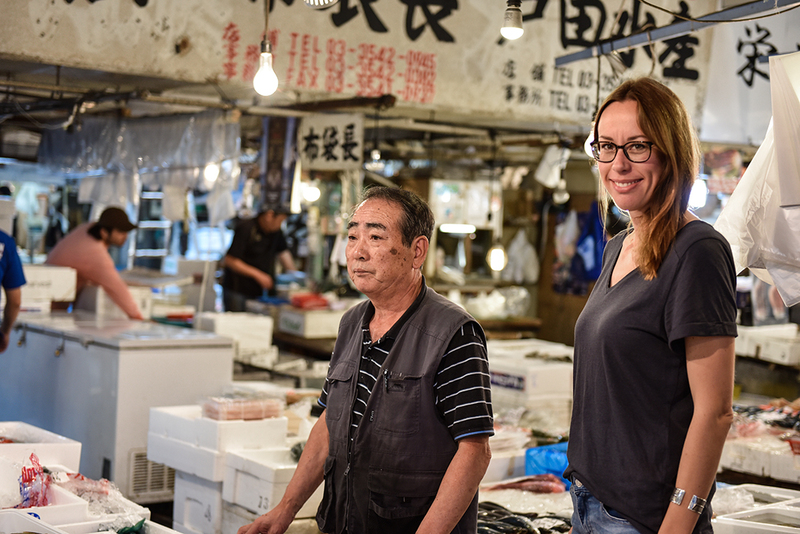 Having lived and worked in two food meccas in the world, Italy and Japan, the restaurateurs say that they can only create fantastic food, if the ingredients are perfect, vegetables picked at the peak of their season, the meat coming from animals that were bred and fed with care and respect. 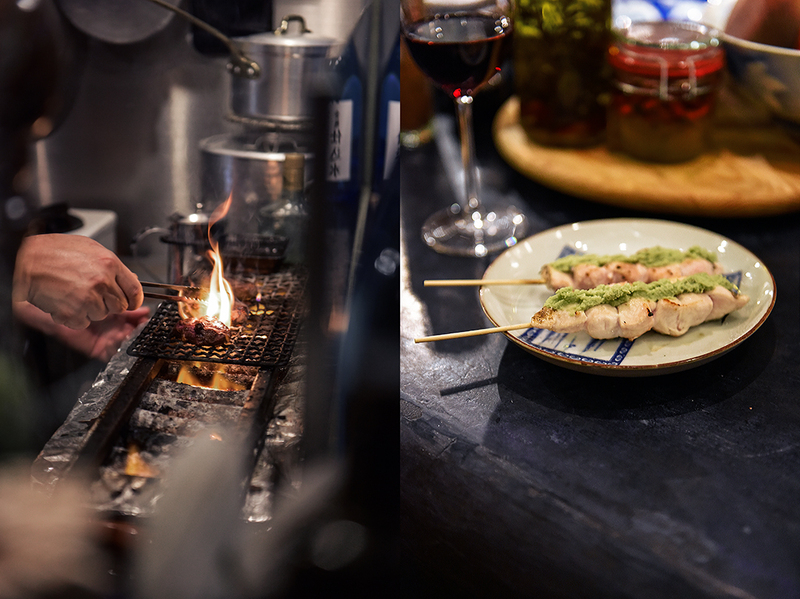 Japanese and Italian cooking is similar, both cuisines are very simple and focus on good ingredients, and at Taka, they create a very complete fusion. 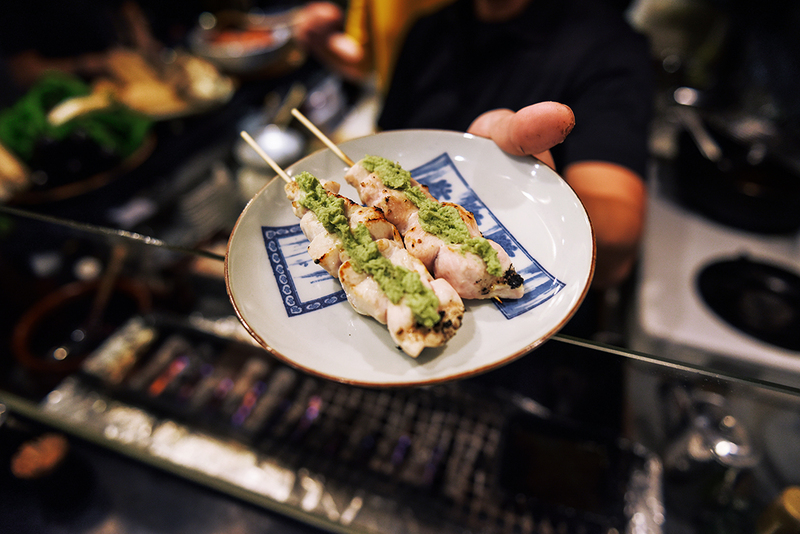 Chef Taka uses chicken of outstanding quality, he knows the farmer and he can guarantee the meat’s quality and freshness, which is why he can serve this dish almost raw. However, it is highly recommended to cook chicken until it’s cooked through. Cut each chicken tenderloin into 6 pieces and thread onto the 4 skewers. Grill lightly until just done. Spread the chicken with freshly grated (!) wasabi and season with salt to taste. Serve immediately. My name is Nishimura Takashi. I lived in Italy for a long time, about 15 years. I worked in a world-renowned restaurant called NOBU. 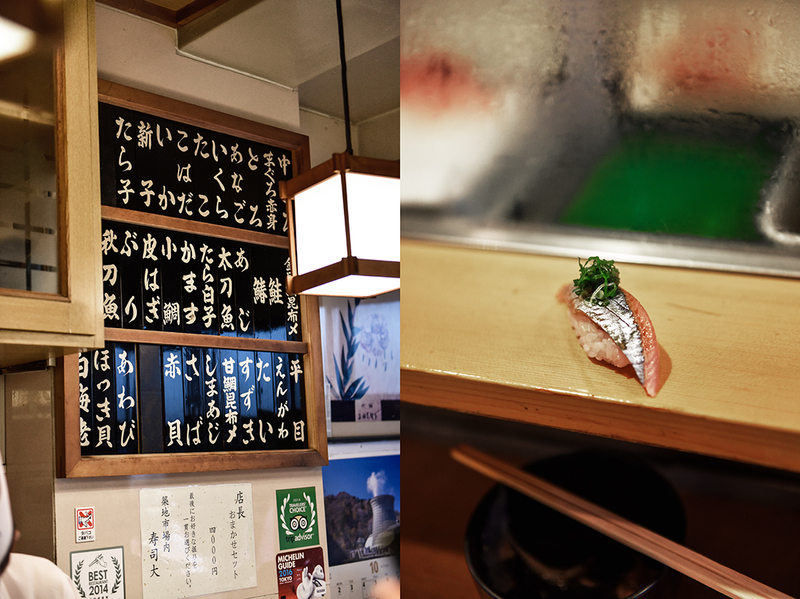 And about 2 years ago I moved back to Kyoto, my hometown, to open this small restaurant. A cherished memory would have to be, when I was a child, all I watched were shows about food on TV. All I watched were cooking TV shows, and I remember cooking a lot with my siblings when we were small. No one in my family is a cook, I’m the only one who followed a career as a chef. And it was when I was in primary school that I decided to become a chef, it was then that I decided to learn how to cook Japanese cuisine. 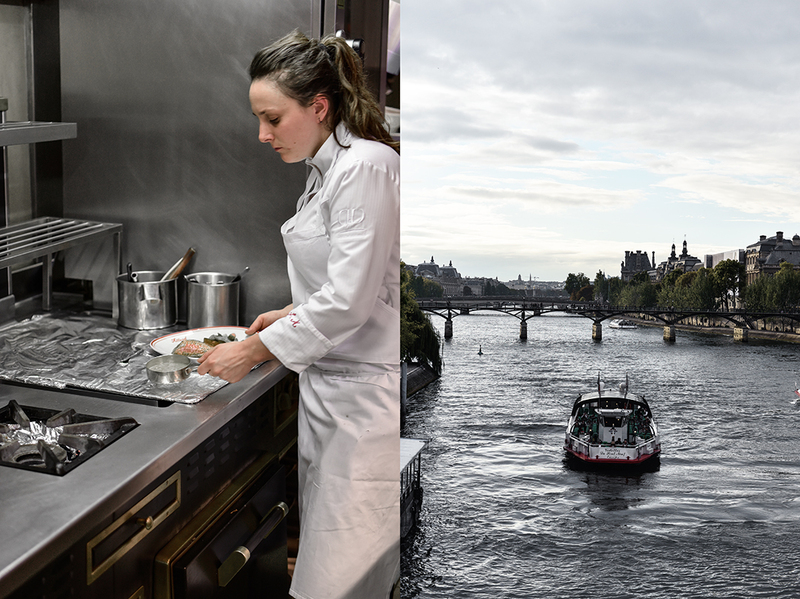 Why did you decide to move to Italy and work in Italy as a chef? Well, I had always made Kaiseki cuisine in Kyoto, I trained in Kyoto Kaiseki for about 15 years. And so then, at that time, Kyoto was amazing, it was a narrow entrance into Japanese cuisine. Now foreigners come here to learn how to cook Kaiseki, but it wasn’t like that at all back then. So I wondered why? 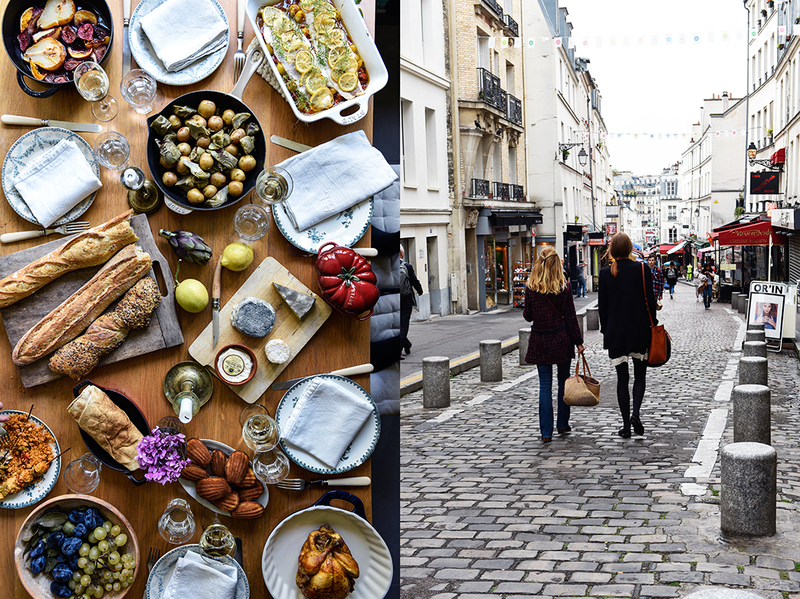 Japanese people go to Italy to study Italian cuisine, and to France to study French cuisine. So I thought, why don’t foreigners come to Japan to study Japanese cuisine? I figured that if that was the case than I wanted to go abroad to teach Japanese cuisine, that’s what I felt I wanted to do. And I remember feeling that I’d been a chef for 10 years, I’d learnt a lot in that time and wanted to share my knowledge abroad. So I chose somewhere that had similar food. 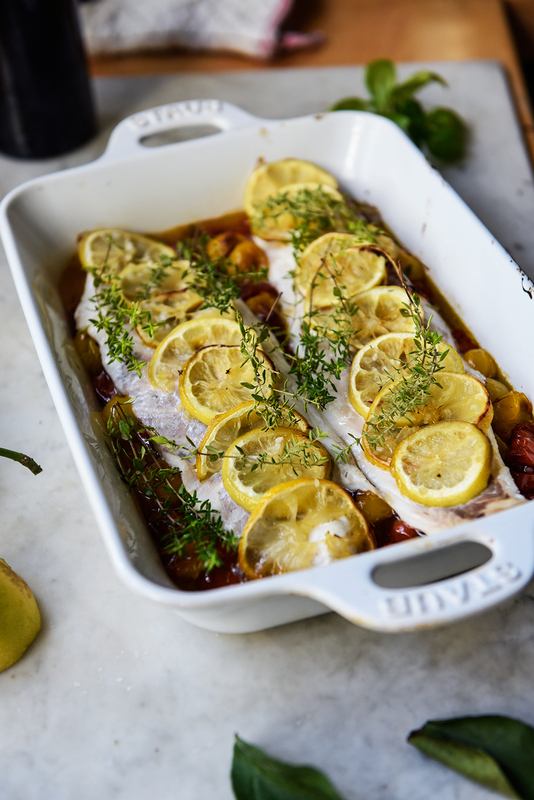 I first chose Italy because I thought they had a simple way of cooking, and ingredients that had a lot of umami, where Japanese cuisine would be accepted by Italian tastes. And then I worked at NOBU in Italy. Now, in the last 10 years, things changed. 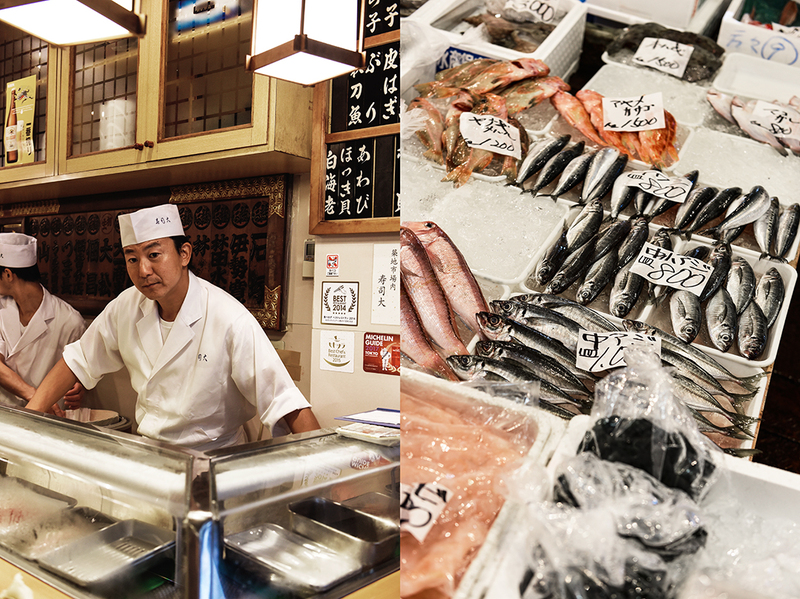 Many chefs come to Kyoto and Osaka, Tokyo, studying the Japanese style. That was probably because Japanese chefs became more open-minded. I think one reason is that they began to look outside Japan more. 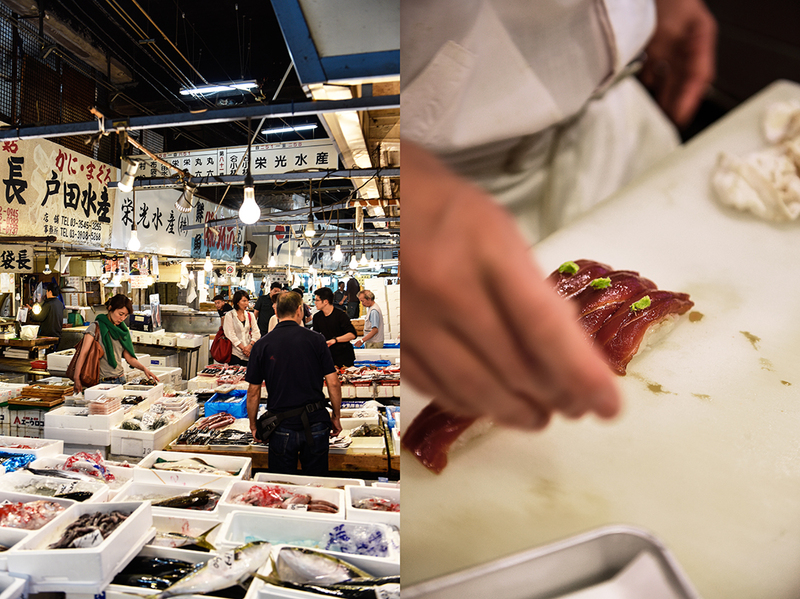 Also, famous chefs wanted to learn more about the mentality behind Japanese Kaiseki cuisine and how to make it. 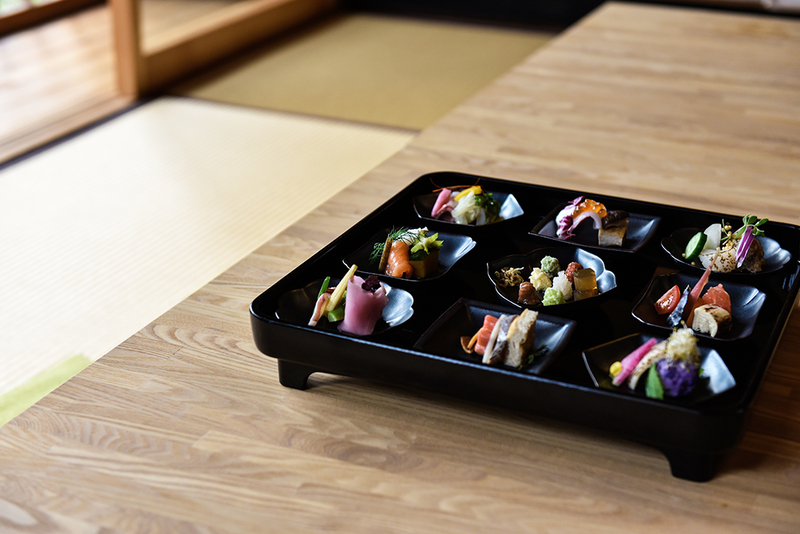 Making each course and slowly serving one small plate after another is Japanese Kaiseki’s style. That’s how you draw people to your restaurant. You’re delicate even when you serve the food, there is even a special orientation for each plate. 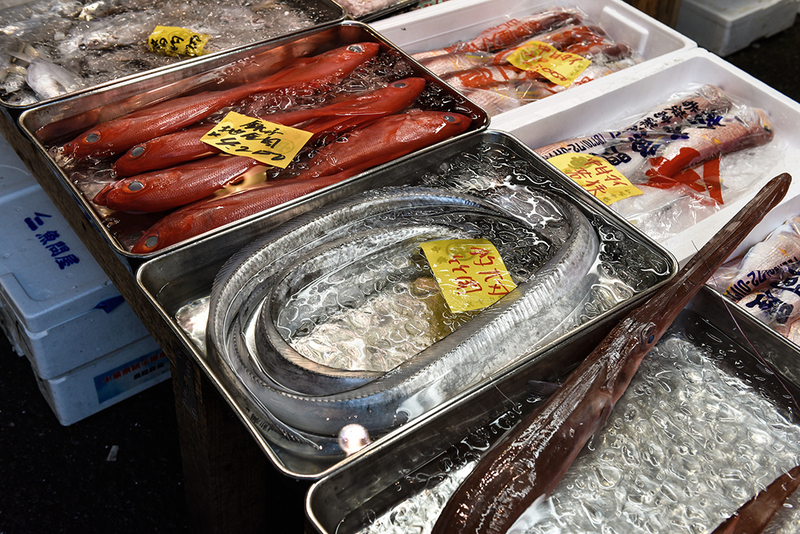 Every country’s cuisine is wonderful, but in Japan it’s all about the cut. For example, how sashimi is cut, how the vegetables are cut, how the meat is cut. These cuts create an excellent style of cooking, it’s Japanese cooking. It’s “katsuru” which means “cuts”, which is what gives it such a high aesthetic. Even with sashimi the chefs cut them beautifully. It creates a very unique Japanese aesthetic. The kitchen knife cuts amazingly, every day you need to sharpen your knives, and sharpening them is one part of a chef’s training, and I think even foreigners now sense this beauty. That’s what I think. Vegetables cut straight, how they’re beautifully peeled into hexagons, all kinds of shapes, the manual work that goes into it is amazing. What makes a good knife? What are the important features of a good knife? Of course how it cuts, the better it cuts the more beautiful the cut is. Also, how it feels when you hold it. You might have the same knife, but their weights can be different. Or there are knives that suit only you, so Japanese chefs will always buy their own knives. There’s also a balance to them. 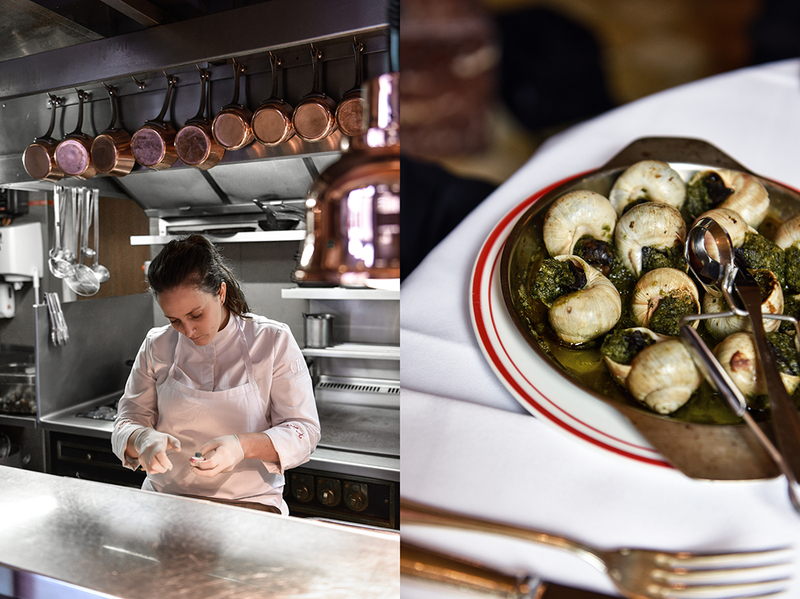 And chefs are using them for a long time, for the entire day, so it needs to not get worn out, it needs to not be a burden for chefs that work for a long time. I think all of these things are considered when knives are made, there’s a long history for this. Japanese knives are very particular. Fish is fish, vegetables are vegetables, meat is meat, and we divide them as such, but I think a knife that can be used for all of these is amazing. 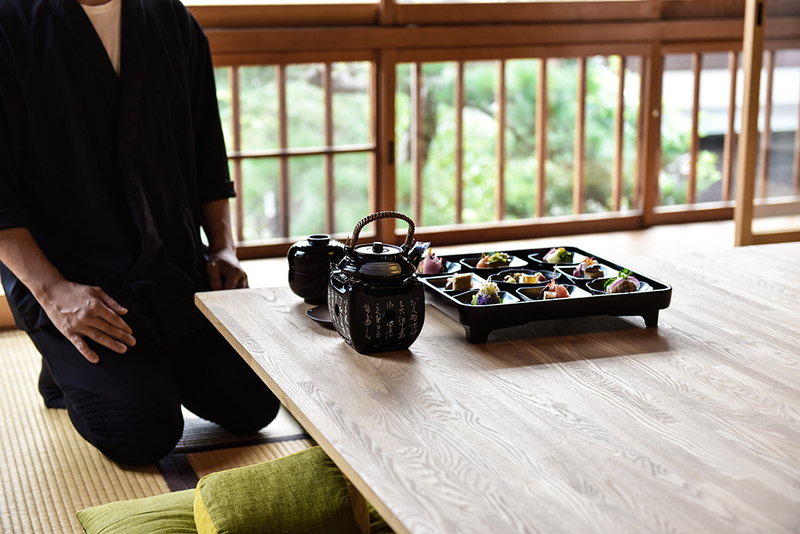 What is special about Kyoto cuisine compared to other parts of this country? I’d say how we compose the meal. There are a lot of difficult things about it but the best thing is how you can enjoy it as you like. Next is how the plates match. There are a number of Japanese meals where you look at the plates as you eat, and there are lots of regions that can make great plates. There’s also the matter of gathering good ingredients. 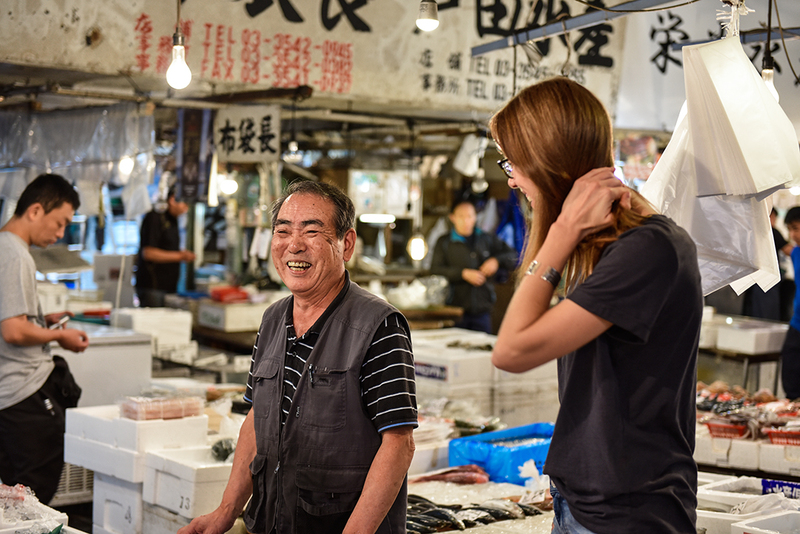 Of course each region of Japan has its own wonderful ingredients, but among those, you have Kyoto chefs who will search all over the place to find the best ingredients of the season and who will think of their customers’ faces as they make them. That mentality is unbroken, it’s passed down from generation to generation, there’s always been this fantastic culture. That’s why there are so many things that I think are amazing. 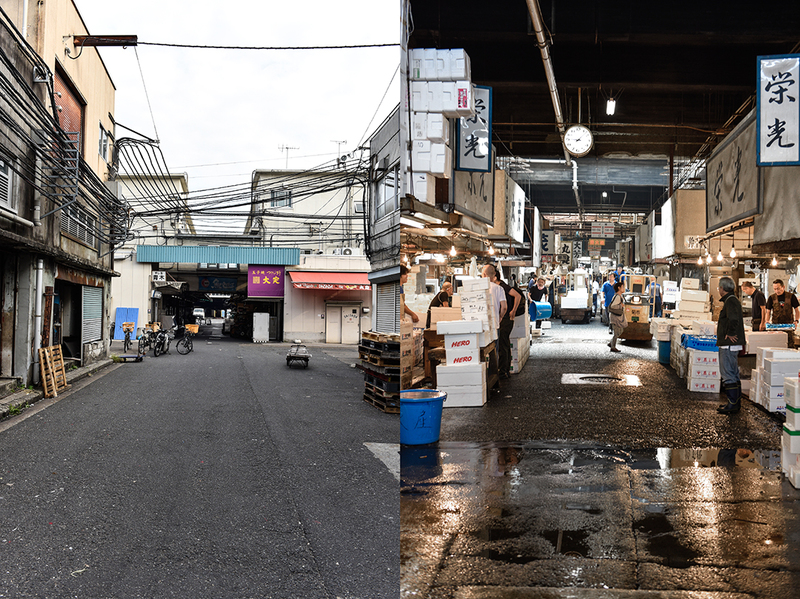 In Kyoto, it’s really easy to distinguish between the 4 seasons. 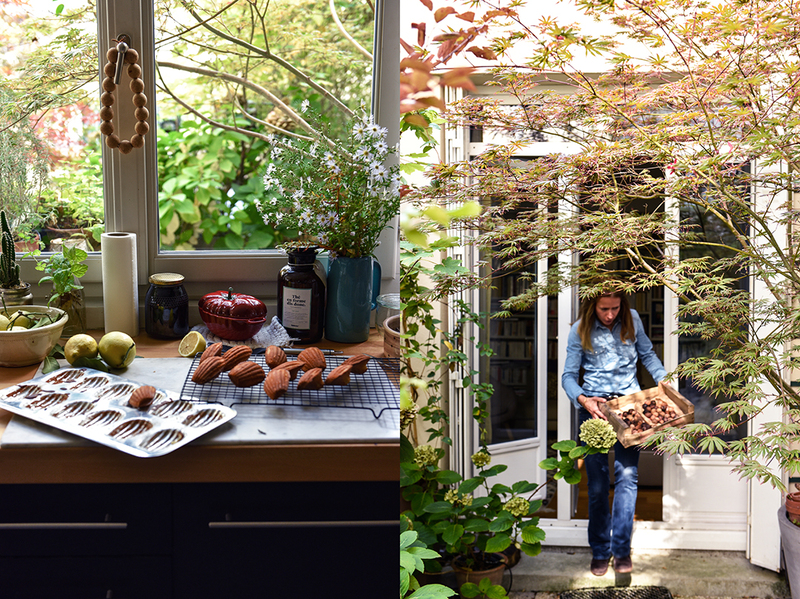 So when autumn comes you can use autumn ingredients and incorporate their beauty into the food. Kyoto chefs understand this sensibility. How close is the relationship between you and your suppliers? That’s a great question. You can do that really easily in Kyoto. 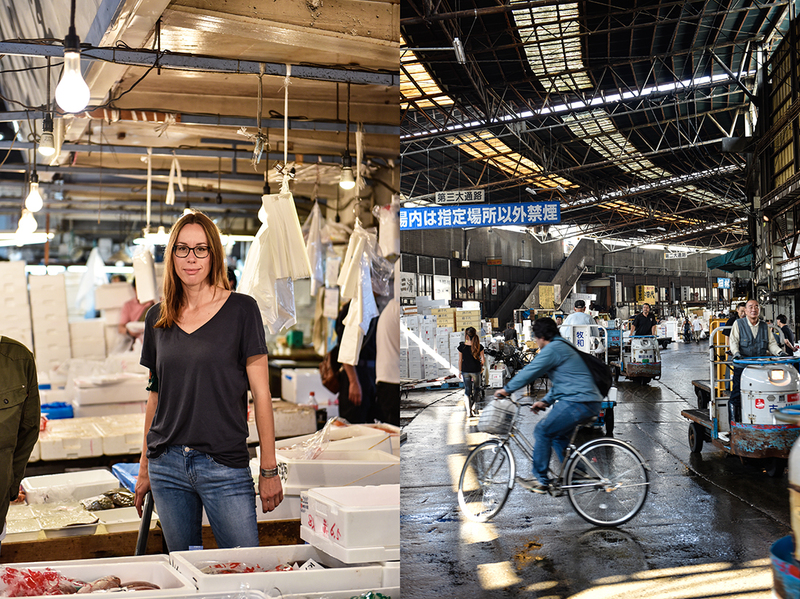 I’ve been working… since I was young, so I’ve been working with suppliers since the beginning. There are fishmongers and vegetable suppliers that I’ve known for over 30 years. People also introduce me to people they know, like butchers. I’ve used a lot of connections, and I try to use Kyoto wholesalers as much as possible, and I want to use them more. I have my restaurant in Kyoto right now. 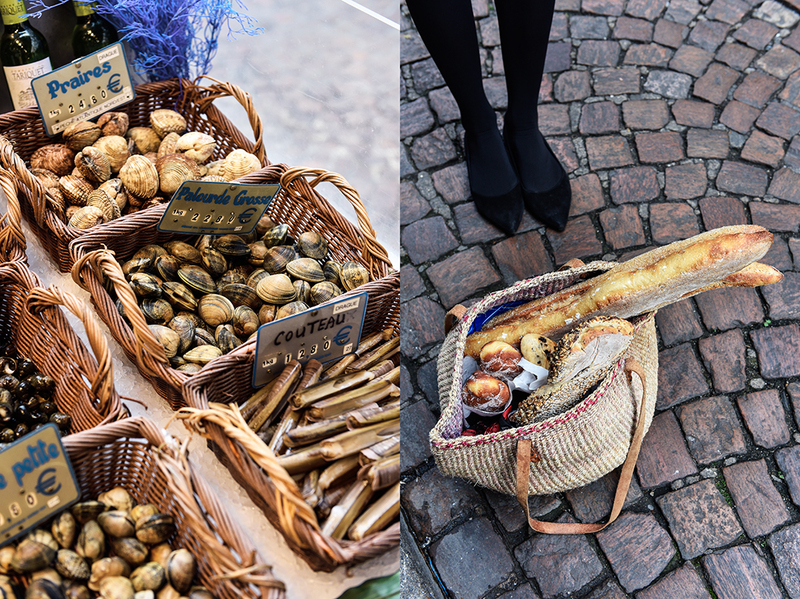 We say “local produce for local consumption”, and it was the same in Italy. 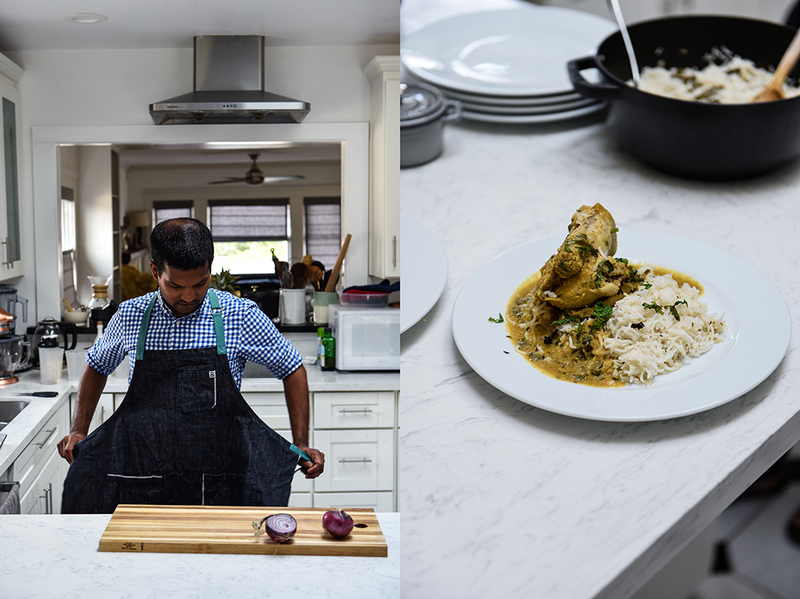 There are ingredients specific to regions and I try to incorporate them in my cooking as much as possible. Now I get requests from the Ministry of Agriculture and other chefs help out too. 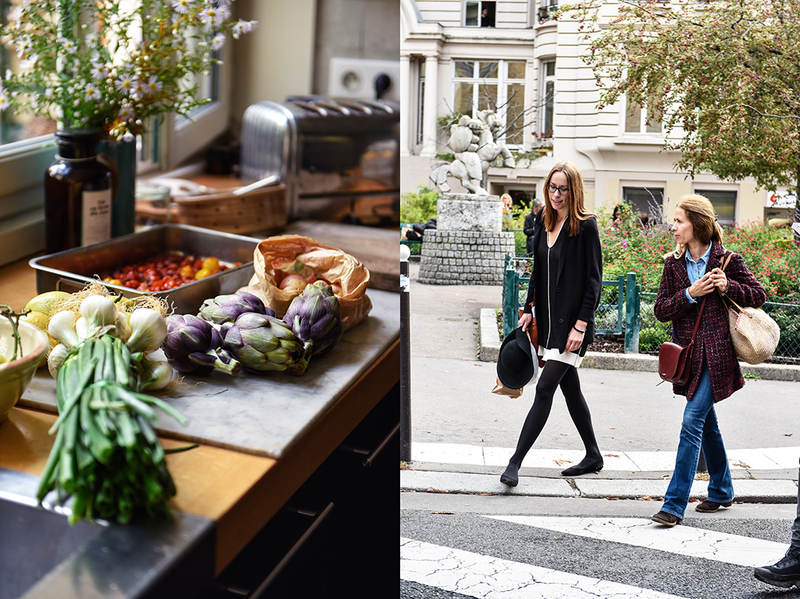 I want to help revitalise the area, so I get introduced to a lot of different people, and I can get hold of good ingredients. That really makes this job easier. 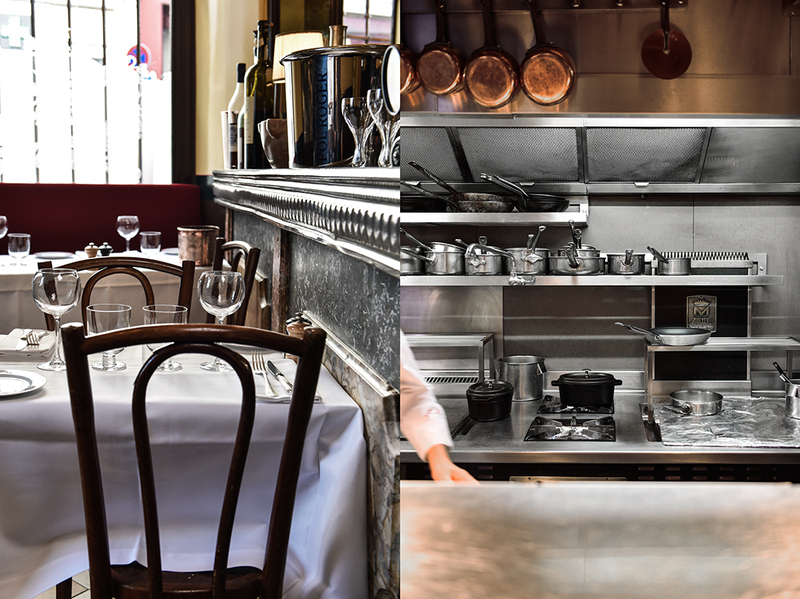 What was your vision for your restaurant? I wanted a small restaurant where I could be close to customers sitting at the counter, so they’re closer to the chef too. 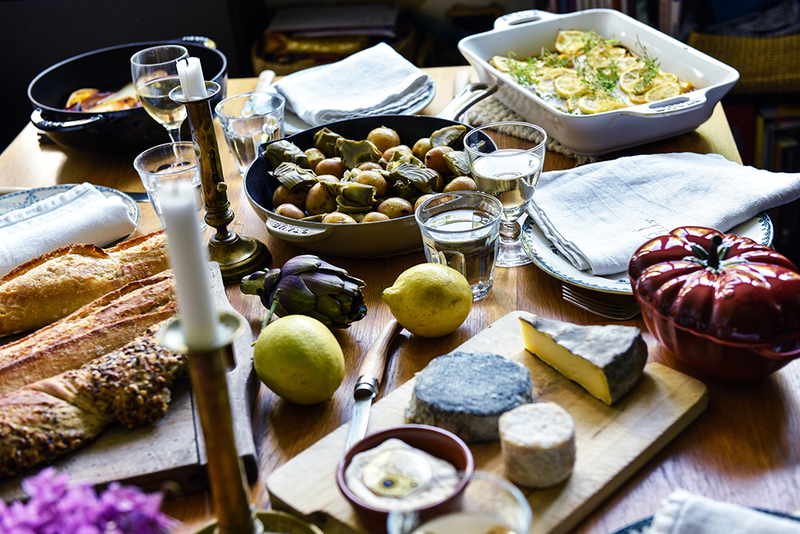 That way everyone can enjoy themselves as they eat, that makes the meal even more delicious. That way people’s circle of friends could grow too. I want to make a restaurant like that and introduce everyone to it. 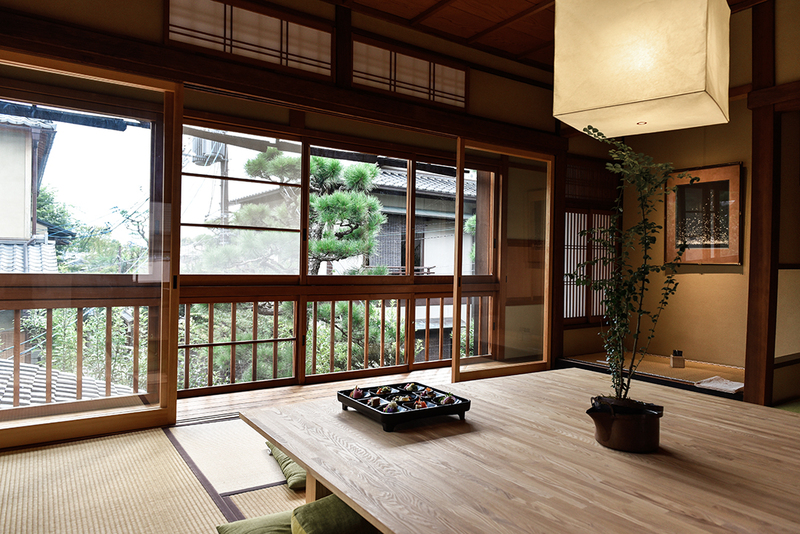 And if I get any foreign customers, I want to help give them a place where they can make wonderful memories of Kyoto. I really wish from the bottom of my heart that I can help them make memories. 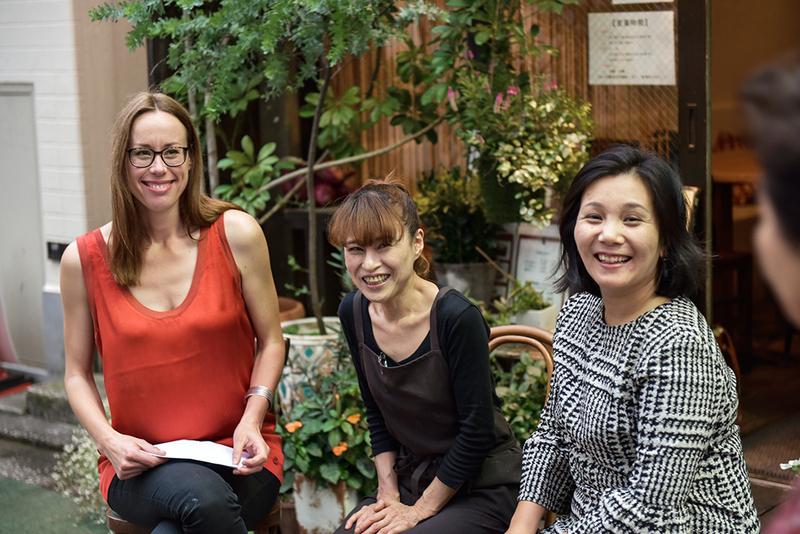 Thank you, Taka and Akane, for creating wonderful food and memories! 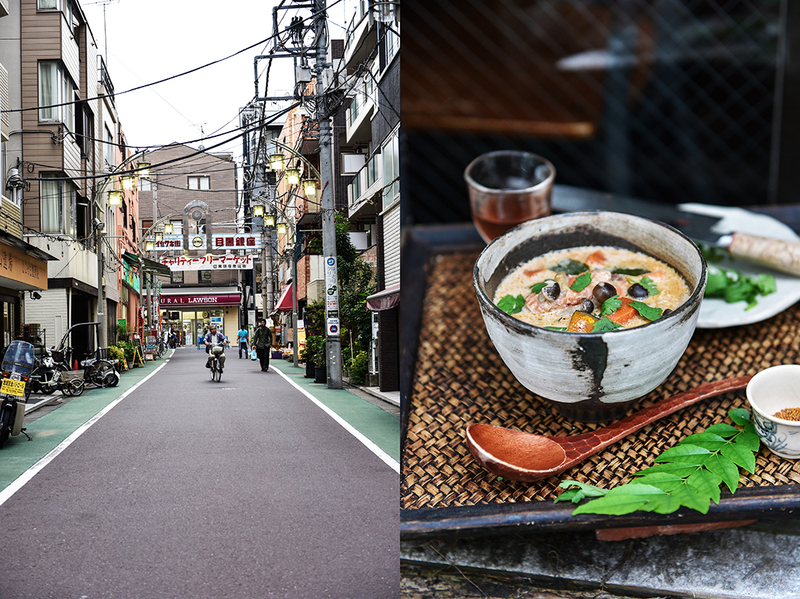 It’s quite a surreal scene that Chef Masako Imura chose for her acclaimed Kakura restaurant: classical music playing in the street from invisible loudspeakers, no cars, but people riding bicycles or walking slowly listening to the gentle harmonies filling the city’s warm air. 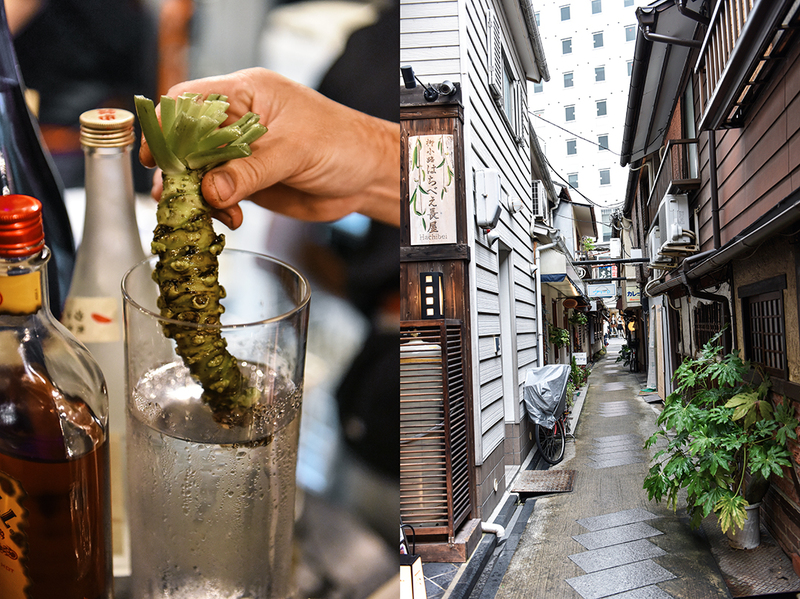 We’re in Tokyo, right in its vibrant heart, however, the peaceful scenery, the narrow house where the restaurant sits snugly speaks a different language. 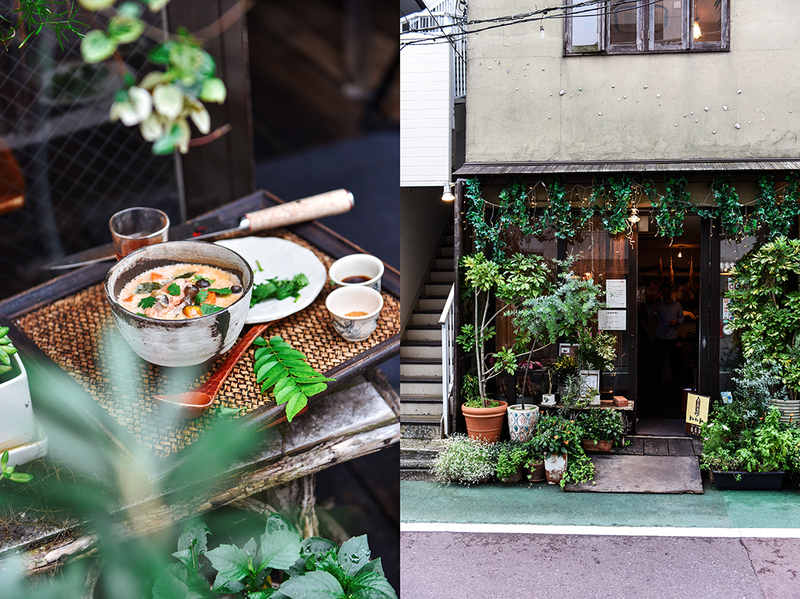 The green facade covered in ivy and sparkling little lights, pots of flowers, herbs, and leafy plants arranged in front of the restaurant’s window, create a vivid contrast to the city’s monotonous grey. 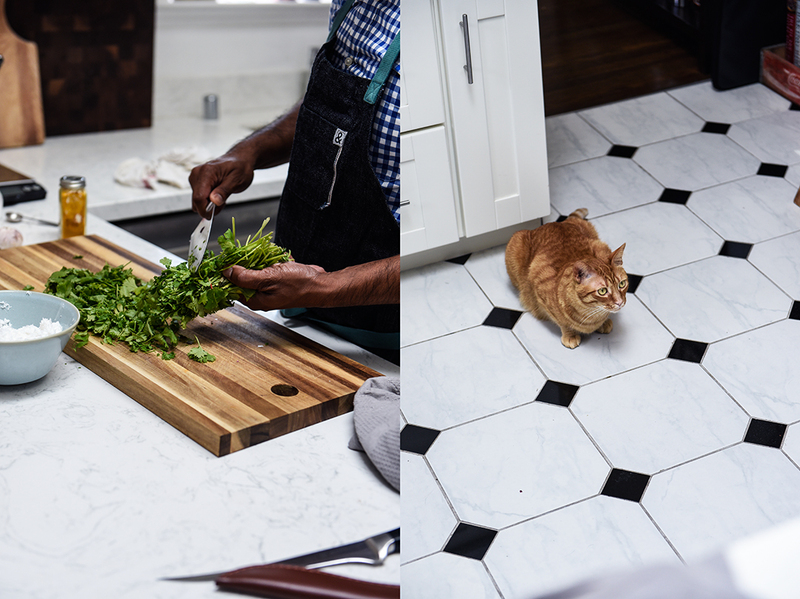 Aromatic mint, basil, rosemary, and curry leaves grow right at the chef’s doorstep ready to be brought into the kitchen and turned into complex spiced dishes. The outside couldn’t suit the inside any better, it’s a green oasis created for a restaurant that celebrates Japanese curry based on the old knowledge of Chinese medicine. Masako Imura’s creations are rich, colorful, and delicious. 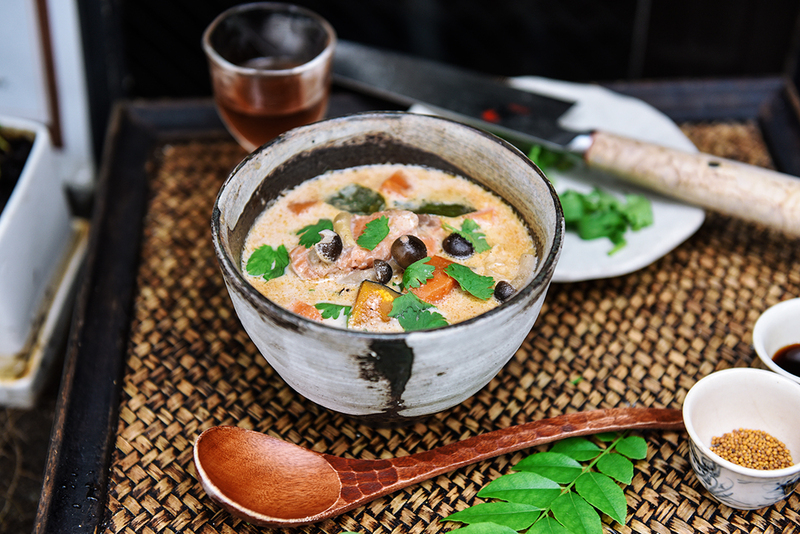 Her Kakura Curry, Black Curry, her seasonal vegetable, or fish curries are a pure pleasure to eat and caress and activate different parts and functions of the body. The nutritionist follows a holistic philosophy, in which mind and body, people and nature complete each other in harmony. 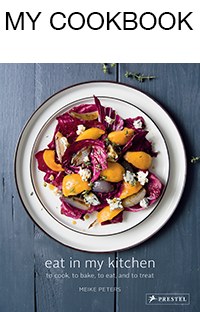 The ingredients that she uses are organic, regionally and seasonally sourced, the chef knows how to treat each vegetable with respect and creativity. It’s about healthful food that gives you energy rather than taking it away from you. 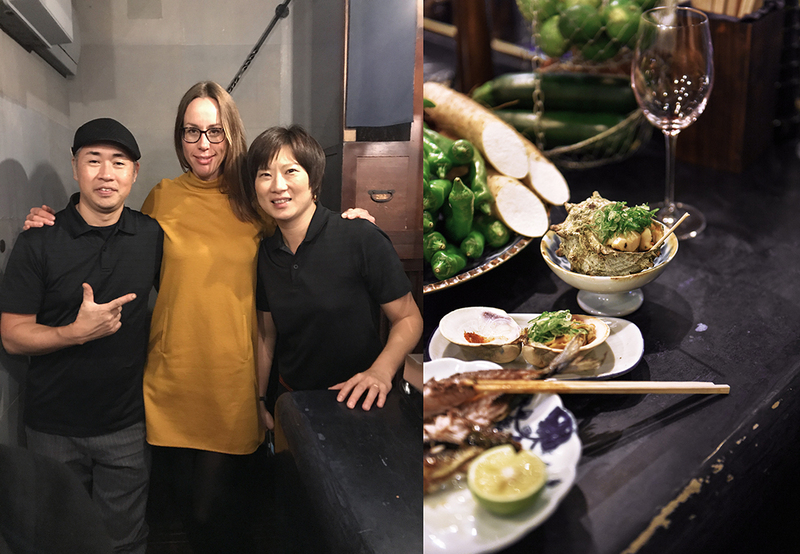 Fans from all over world, many artists and musicians, love her beautiful cuisine, all those fascinating flavors that Masako brings to the table at her cozy restaurant that she opened in 2005. The food warms up your soul. 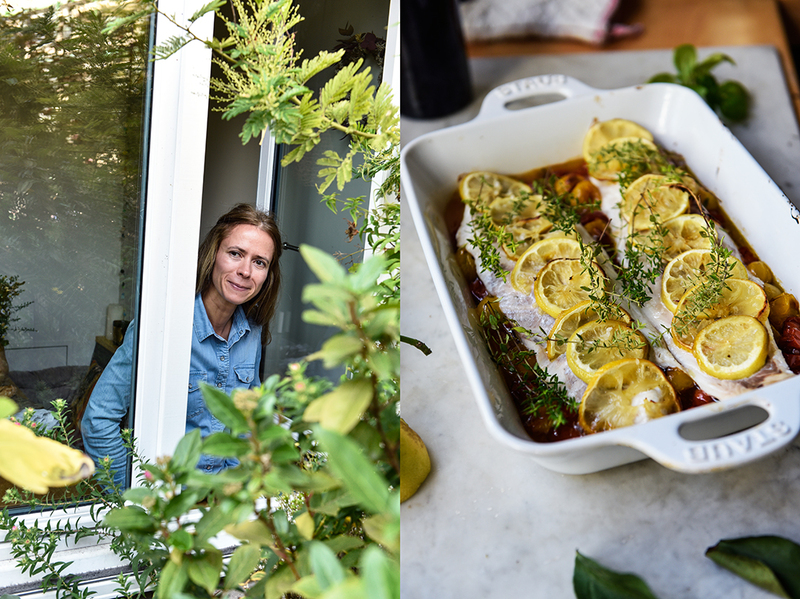 When you get a chance to meet her in her kitchen for a few hours to chop and chat, and peek into her pots and pans, you get a glimpse of this universe that makes her creations so unique and special. 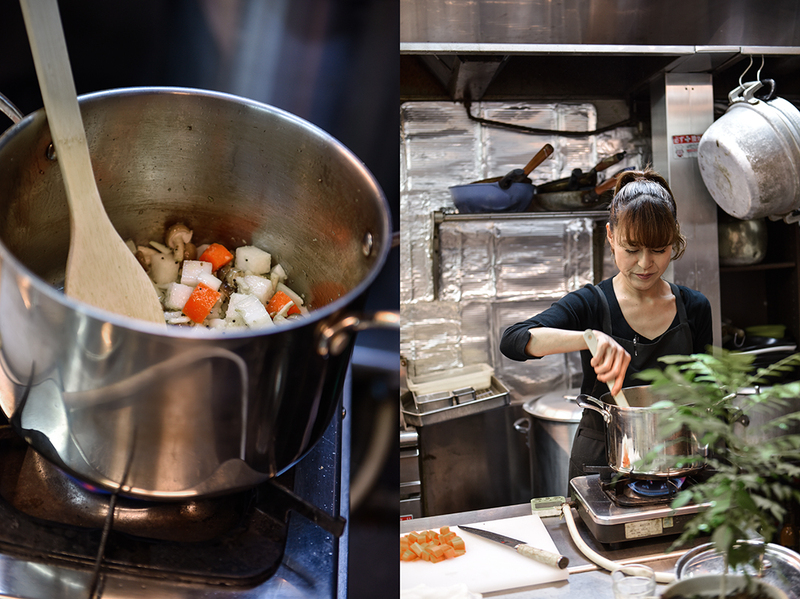 Spices are her most important tool, the heart of every composition. 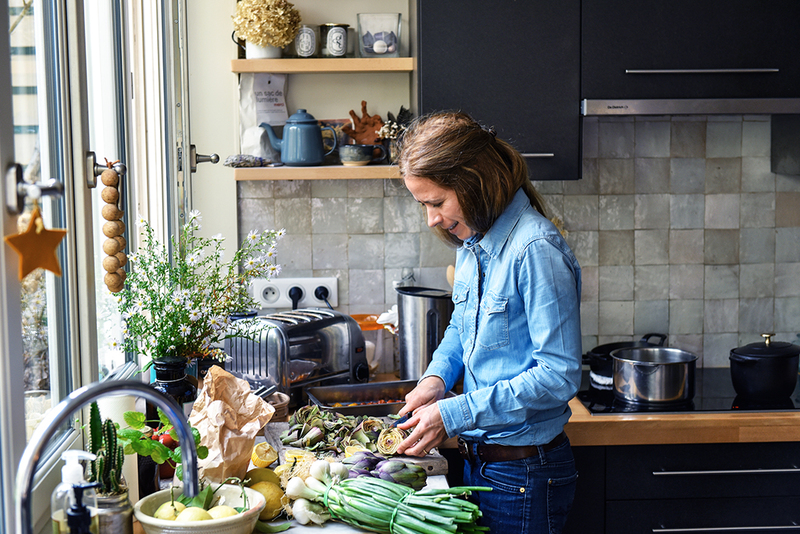 She works with perfectly balanced curry mixtures, individually put together for each dish, like in the fish curry that she shares with us. The warming fragrance of mustard seeds and curry leaves sizzling in hot oil are the start, the tempting invitation, before the other parts follow to add more depth: Nam Pla (fish sauce), shrimp paste, ginger, and colorful spices, which she attentively arranges in little bowls next to the cooker. 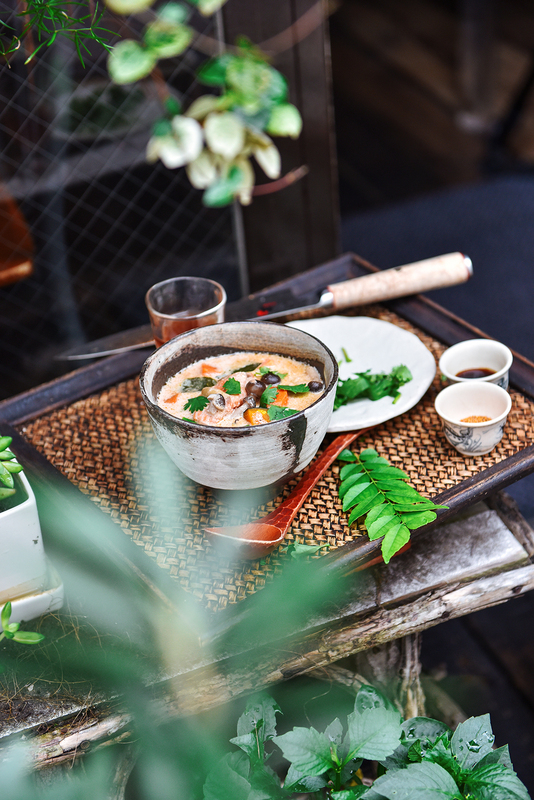 Lotus root, sticky Japanese potato, golden pumpkin and carrot, and various mushrooms lend freshness and flavors to a creamy sauce full of heat. 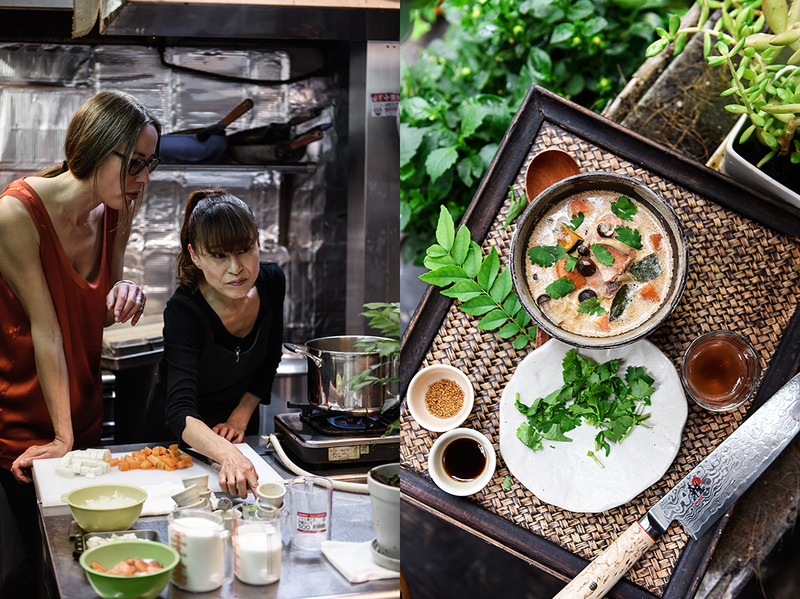 The love for the kitchen lies in the family, Masako Imura’s mother taught her daughter how to cook and use food for more wellbeing. Masako was the youngest, but physically the weakest, her mother paid a lot of attention to her girl’s diet. Nourishing, natural, and rich, using Chinese medicinal cuisine, it helped her to become the strong and inspiring woman that she is today, loved for her curry creations at the Kakura restaurant. 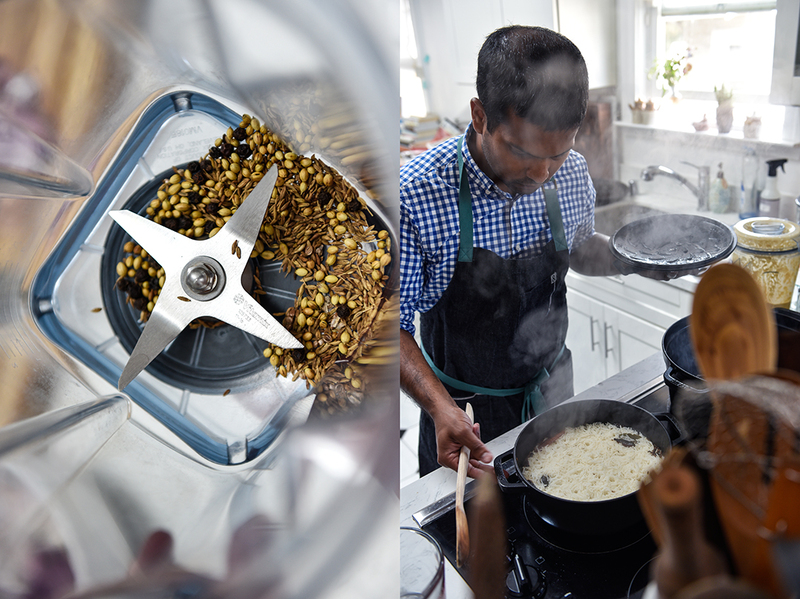 In a large pot, heat the oil, mustard seeds, and curry leaves over medium-high heat for about 15 seconds or until the seeds start popping. Add the onion, radish, carrot, and shimeji mushrooms, turn the heat down to medium and sauté, stirring once in a while, until soft. Stir in the cayenne peppers, ginger, garlic, shrimp paste, salt, and fish sauce and cook for 1-2 minutes; then add the garam masala, coriander, cinnamon, cardamom, garlic powder, coconut powder, almond powder, and sweet radish root, stir and cook for 1 minute. Pour in the water and milk, bring to a boil, and cook, uncovered, for about 20 minutes over medium heat. Add the lotus root, yam, and pumpkin and cook for about 5 minutes or until soft. Gently stir in the white cloud ear mushroom and salmon and cook for 5 minutes or until the salmon is cooked through; season with salt to taste. 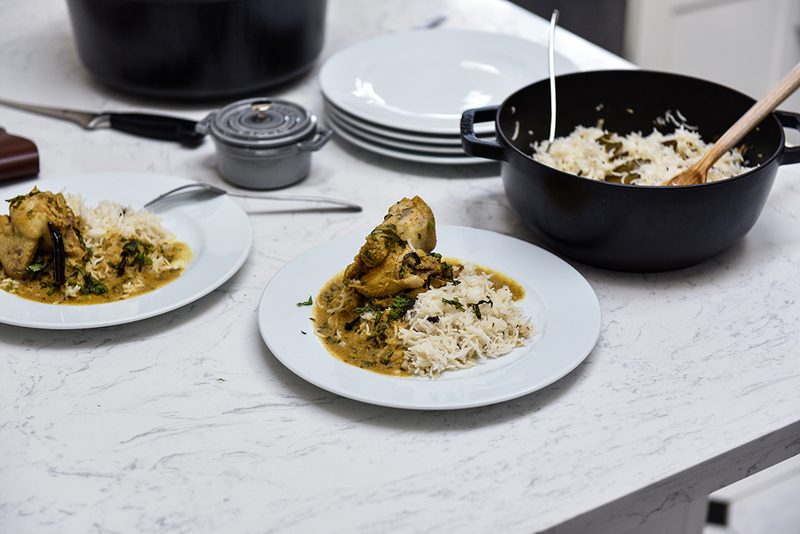 Divide the rice and curry between bowls, sprinkle with fresh coriander, and serve immediately. 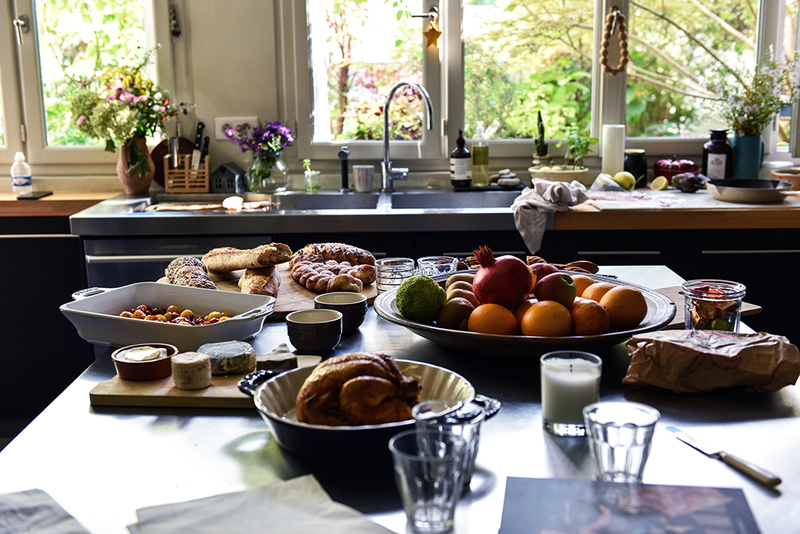 What is your most cherished childhood memory in the kitchen? I couldn’t eat carrots, so every day my mum would mash them up so they were easier for me to eat. Every single day without fail. Now I love them. How old were you when you decided to become a chef? It was actually quite late, I was 25. Actually, I used to be a cooking instructor, but I was 25 when I wanted to work in a real restaurant as a chef. 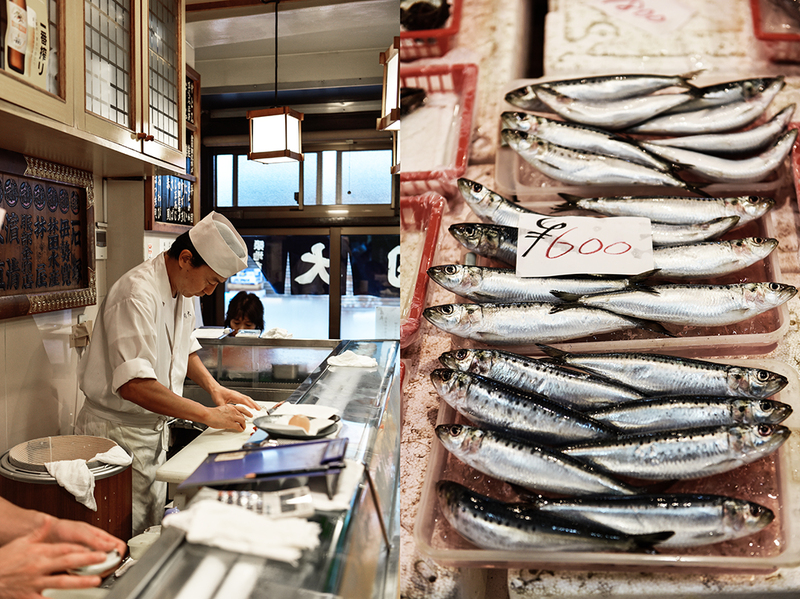 What makes Japanese cuisine so special? It has to be the culture of using dashi. Western cuisine uses stock but in Japan we use kelp and bonito and have the custom of using dashi instead. 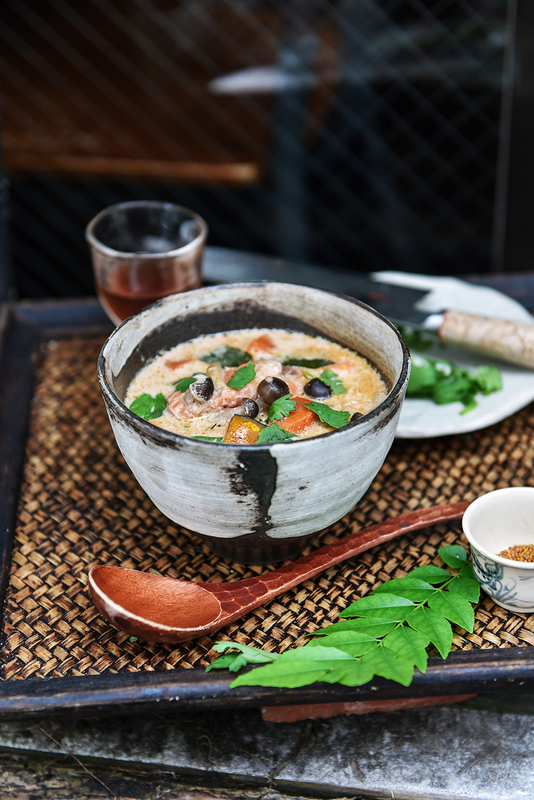 Staple Japanese food will almost always harness dashi, giving them a subtle undertone of flavour. I would say that’s what makes Japanese cuisine special. What kind of dashi do you use in your restaurant? I use dashi made from kelp and dried shiitake mushrooms. Which role does curry play in Japanese cooking? I would say it’s similar to Japanese miso soup, each family will have their own curry. Mum’s curry will always taste like mum’s curry. We’ve always had miso soup, but lots of Japanese people say their favourite curry is their mum’s curry. But each Japanese family will have their own Japanese curry. Normally. 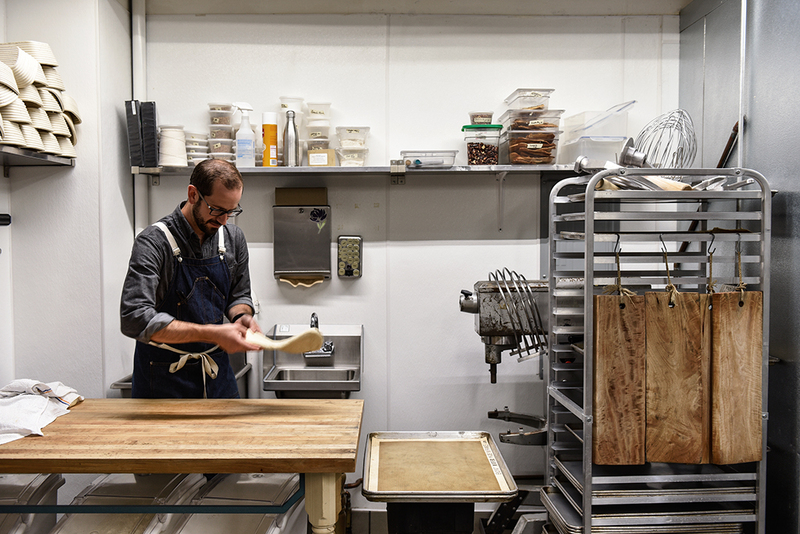 Do you have a close relationship with the suppliers of your restaurant? There are suppliers I’m close to and those I’m not so close to, but I buy products from them because I trust them, because they’re people I know. 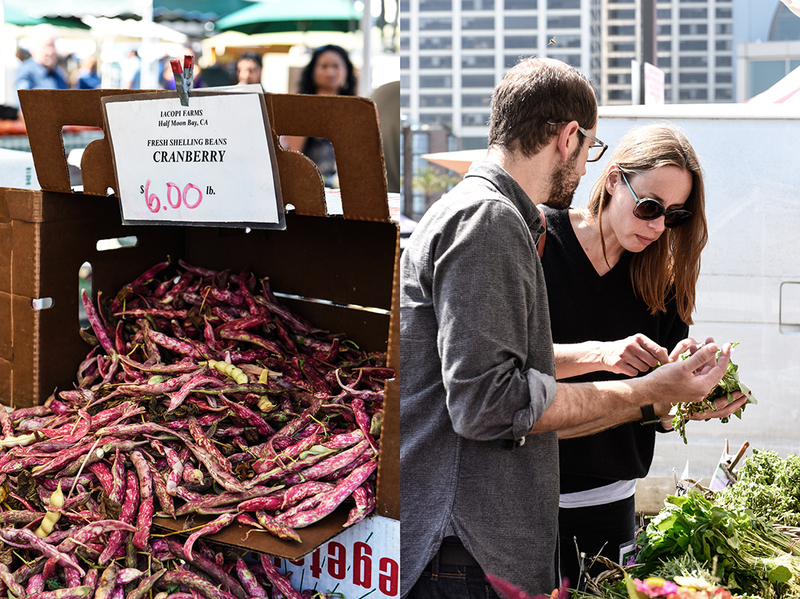 Are organic and local products important to you? Is there a rising interest in Japan for organic food? Do you think that the people – over the last few years – became more critical with their food? 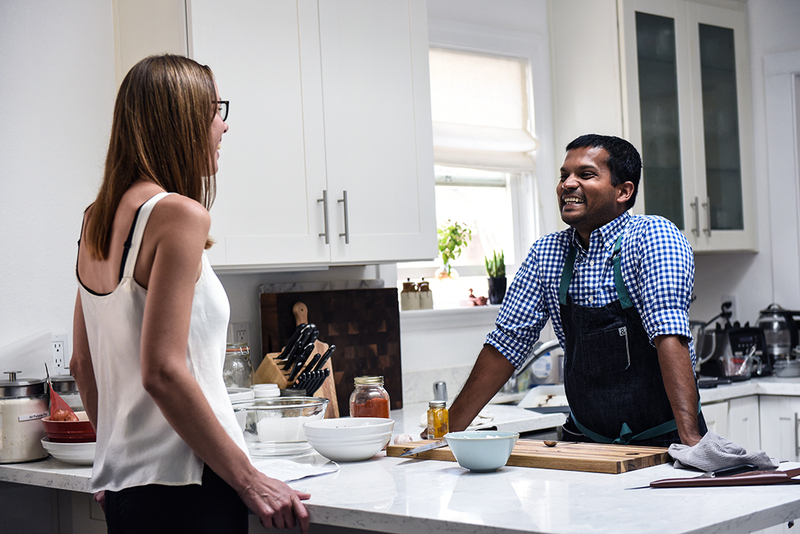 I’ve found that lately more and more people are concerned about their health, and so I’ve been getting a lot more customers who express interest in organic and chemical free food, as well as cuisine that incorporates Chinese medicine. What fascinates you about Chinese medicine? The more I learn about Chinese medicine the more it makes sense, so I study more and more. Of course, each person is different so I have to learn what that means. There are things that will work for someone but not for others, so I diagnose each individual and carefully select the Chinese medicine that works best for them. I love it that, what each person has to eat, is always going to be different. Where did you learn about Chinese medicine? I studied at the Japanese branch of the Beijing University of Chinese Medicine. What made you so interested in Chinese medicine? I’d have to say it was when I was young, my mum used natural things. She actually used natural Chinese medicine more than conventional medicine. Well, we went to the doctors when we were sick, but if we had to take medicine, had to put something in our bodies, we took Chinese medicine. Yeah, that was it. Ever since I was really small, we went to a Western hospital for treatments, but if we had to take anything she always used these really old, traditional Chinese medicines because she thought they were safer. That’s how I was brought up. Then I learned a little about macrobiotics and all sorts of other things. But it wasn’t because I thought “people have to eat these”, it was because each person’s biological makeup is different. And so, I started to make food using Chinese medicine for individuals to match their individual makeup. I slowly realized that I didn’t just have an interest in this, that this was real cooking. There are foods that can be good for certain people but not good for others. There are all kinds of medicinal diets that are good, but finding the right ones for each person can be a challenge. What’s the clients’ feedback? Do the people come because they want healthy food? Or do they just come because they find it’s delicious? I think they come because it’s delicious and healthy. Because they want to be healthy in a delicious way. What’s your association with the cherry blossom season? It’s the season students start the new school year so it’s seen as the season of new beginnings. It makes me feel really optimistic. 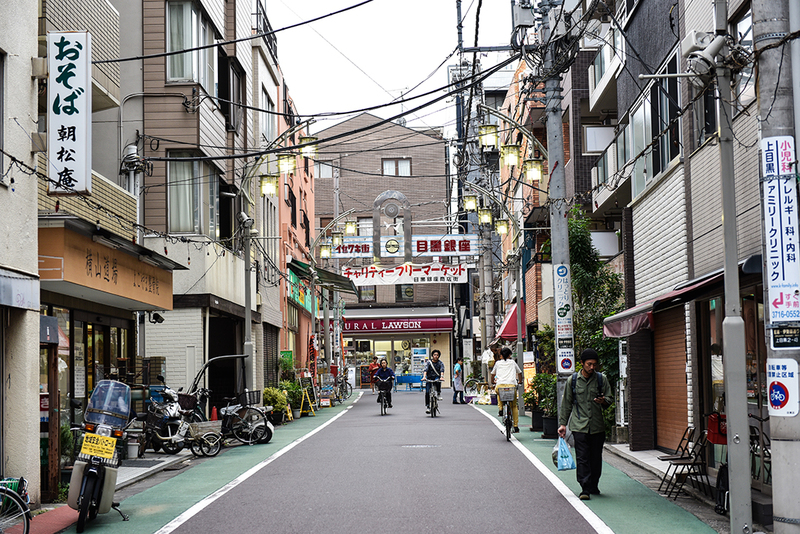 This area here called Nakameguro is famous for a lot of cherry blossoms, it’s also called a town of cherry blossoms. Can you use the blossoms for your cooking? Yes, I use them a lot. I put them into the rice, ice cream, and pudding. The ingredients I use will vary depending on the season, but they’re all good for you. Thank you very much, Masako Imura! 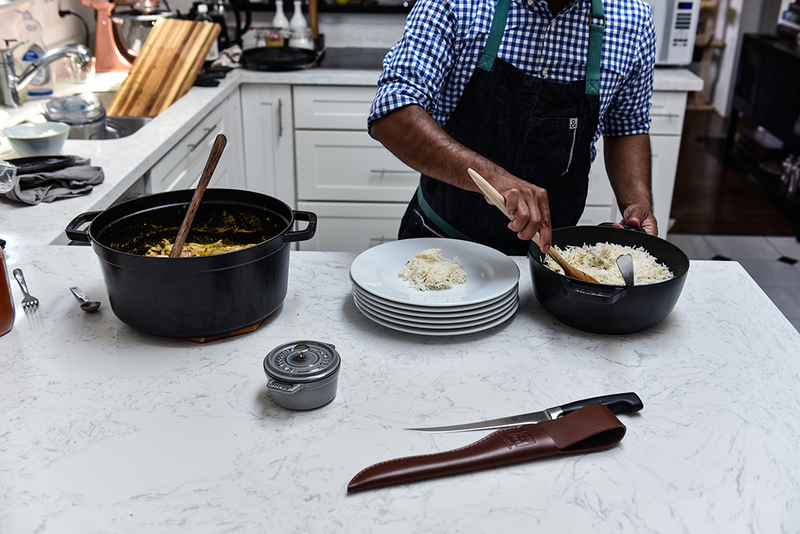 Spices, aromas, and flavors, and a great portion of tradition paired with curiosity create an exciting mix in Nik Sharma’s kitchen. 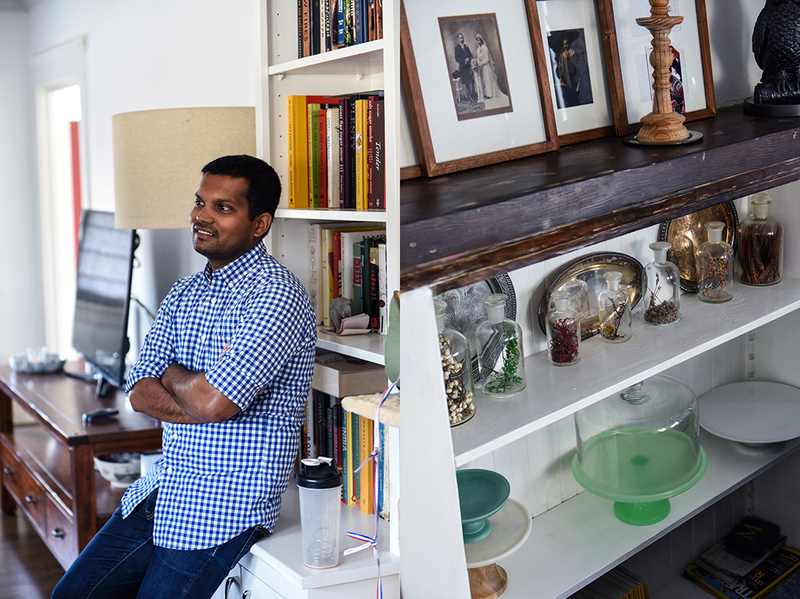 Two worlds woven into his life feed the man’s inexhaustible creativity: India and the USA. The first country marks his roots, the land where he was born and raised, the latter represents his life since he was 19 and decided to leave the known behind and start an adventure that lasts till today. 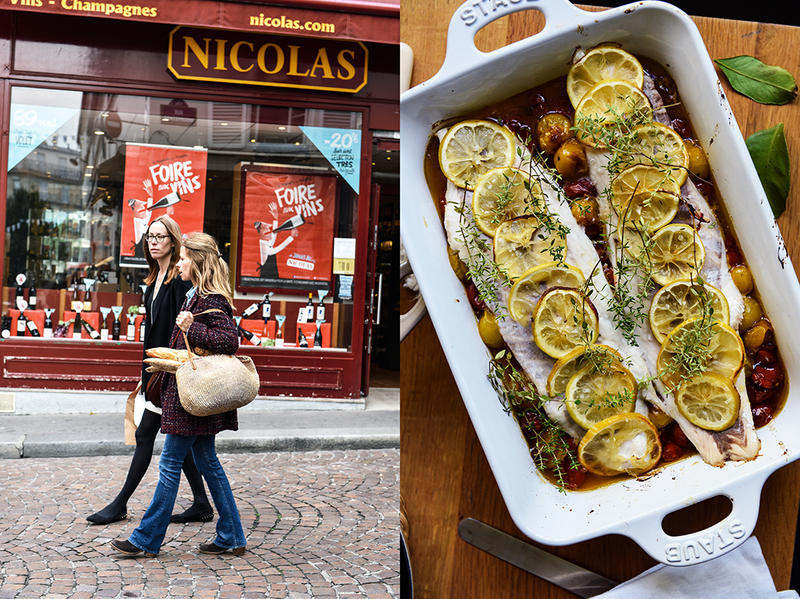 Nik established a renowned food blog over the past few years, standing out from the start, visually and culinarily. 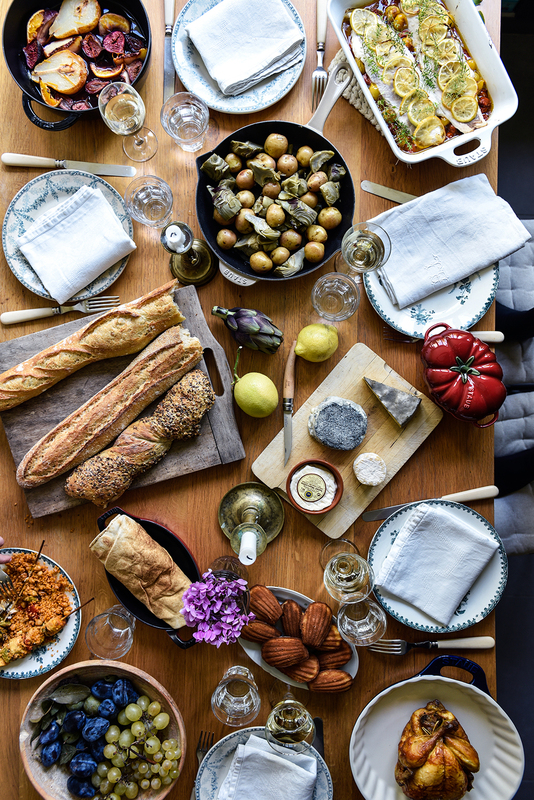 A Brown Table is loved for its eclectic recipes and stunning pictures. 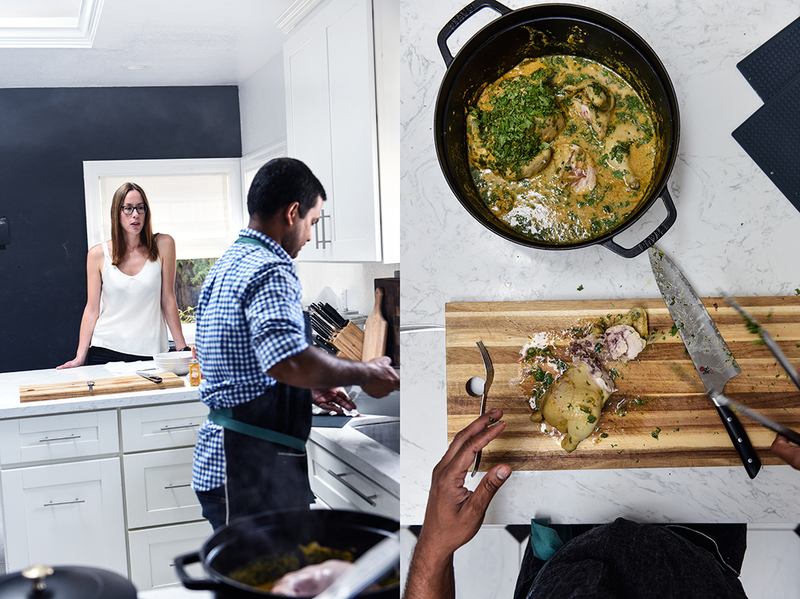 As a cook, Nik makes you hungry, as a photographer, he creates a unique mood that is captivating, appealing in a way that you want to frame his photograph and hang it on the wall and at the same time go straight to your kitchen and cook and eat the dish. He won Best Photo Based Culinary Blog awarded by the International Association of Culinary Professionals (IACP) two years in a row, quite an astonishing career for someone who only grabbed the camera professionally in his mid twenties. The fact that his dad was a successful photographer in advertising might have influenced the young man’s feel for light and compositions, but Nik says there wasn’t that much of an exchange about his work between father and son, he only learned how to use a camera after he left home. 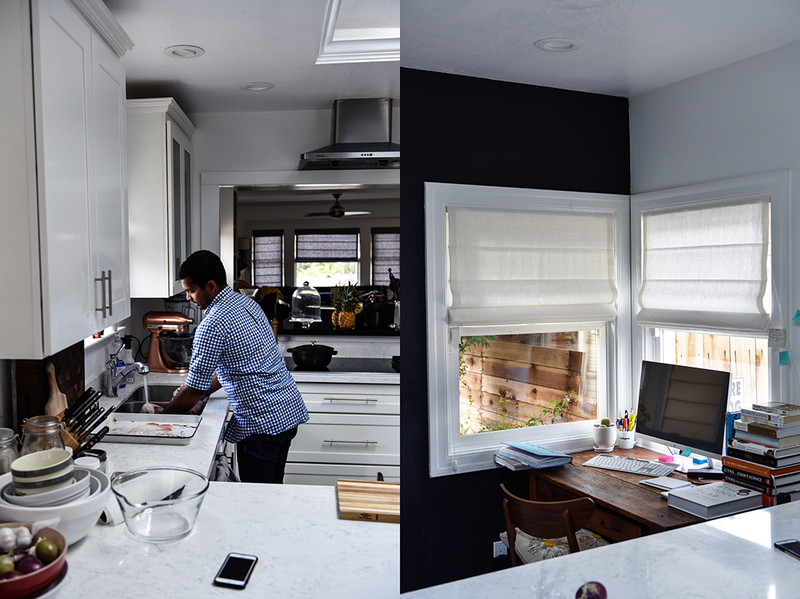 But despite his parents’ warnings – they told him not to follow their footsteps – the photographer, blogger, and soon to be cookbook author did what many kids do: he did it anyway. His mother worked in hotel and restaurant management, she didn’t like cooking, but she had a huge folder full of recipes collected from newspapers and magazines. Nik was fascinated by the world of cooking and baking at an early age, he loved spending hours reading through Indian and western creations, he joined the family’s cook in the kitchen, and eagerly followed his maternal grandmother’s culinary activities. 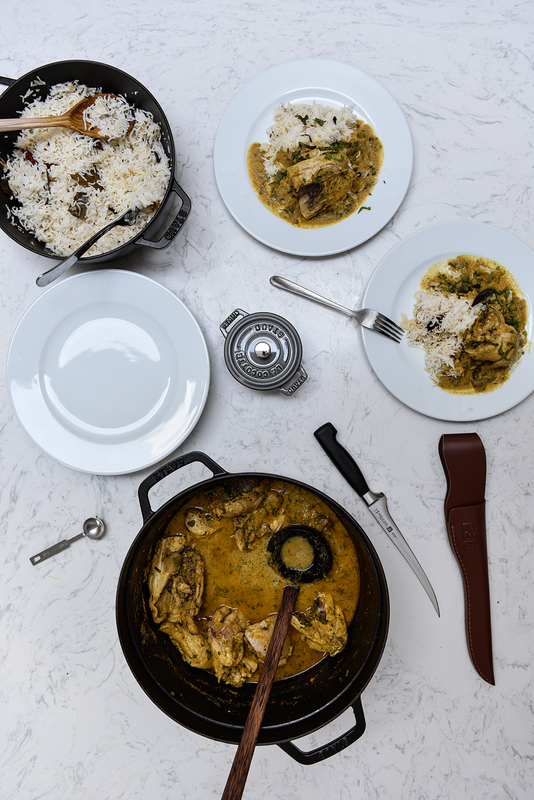 Her Goan heritage is still very present in many of his own recipes. Reading the titles of Nik Sharma’s recipes makes your mouth water, you can literarily smell the warm aroma of cinnamon, ginger, turmeric, cayenne, and rosewater filling the kitchen: Imagine Masala Chai Pumpkin Cake, Khasta Kachori (Edamame-stuffed Fried Indian Bread), Honey Sage Turmeric Wings, Goan Coconut Cake, Cherry Black Pepper Cake, or his Toasted Pistachio Cake with Blood Orange Sauce. 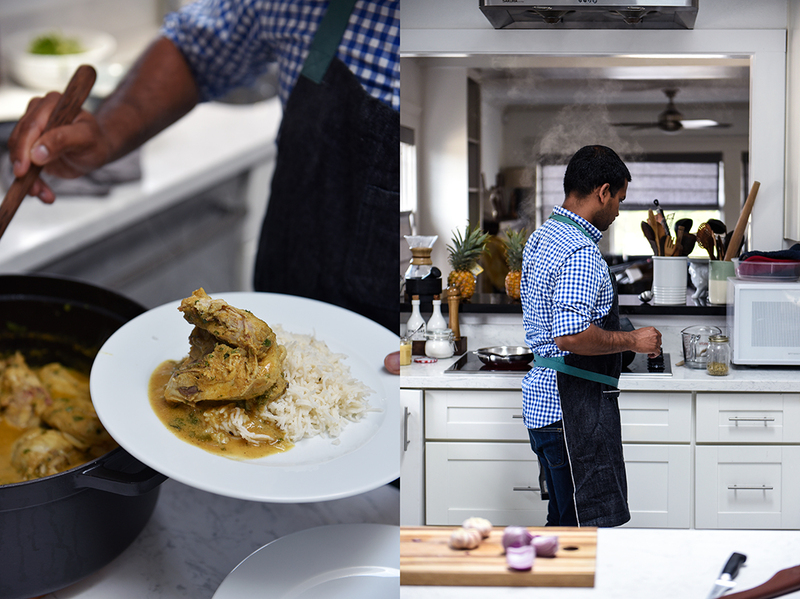 The recipe he shares with us for our Meet In Your Kitchen feature is a vibrant explosion framed in comfort food: Goan coconut curry with tender game hen and aromatic spiced rice. 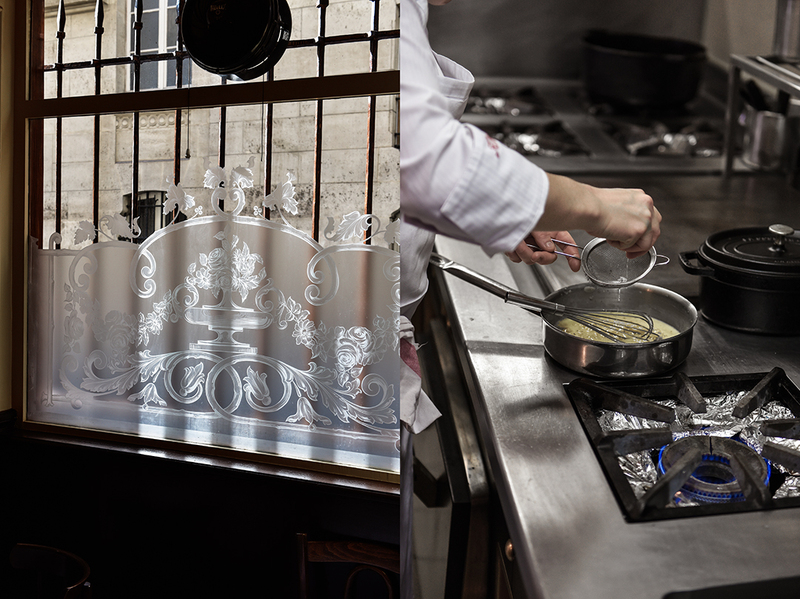 The cook’s approach to food is scientific, Nik has an analytic mind and way to think about dishes, but at the same time he looks at things from a “feminine standpoint”, he likes curves and his styling reflects that. “I always think of ballet dancers when I shoot, I envision the dish being a solo dance performer on stage, the light’s only focused on the dance and everything else is dark. I always think of dance and curves, I find them very sensual, I find straight lines and diagonals a little harsh. Even if I do introduce them in my composition, you’ll see that there’s a circle cutting through, like a tangent. Again, I bring math into it because I’m a geneticist by training”. You can be a gourmet, an aesthete, and share the beauty of life, but if you’re a critical mind, you know that there’s always more to talk about at the table: You can often see Nik’s hands in his photographs, to show the technique of a recipe, the preparation and instructions, but also to showcase that there are people from different backgrounds, that there is diversity behind the scenes of a restaurant. Nik says “We don’t really see them because they are never brought to the front”. 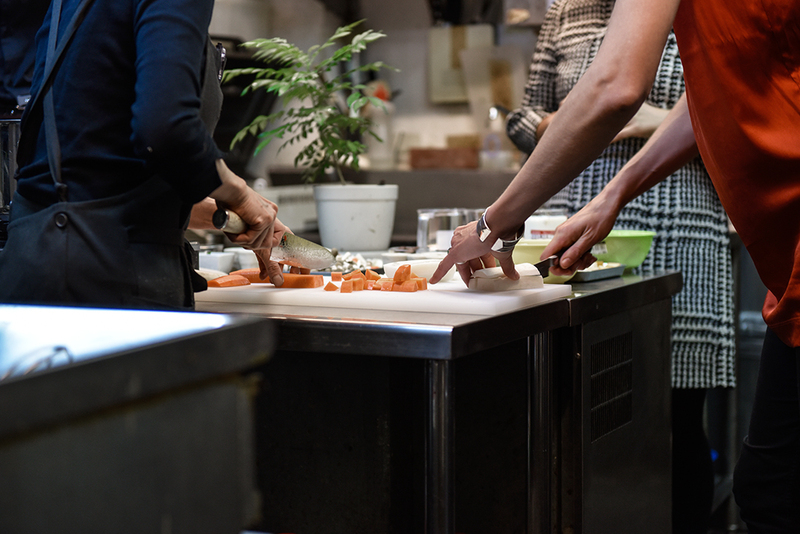 There’s an imbalance in our society, a hierarchy in the way who works in the front or the back of a restaurant, and in the way people are paid and it’s our responsibility to talk about this imbalance and solve it. 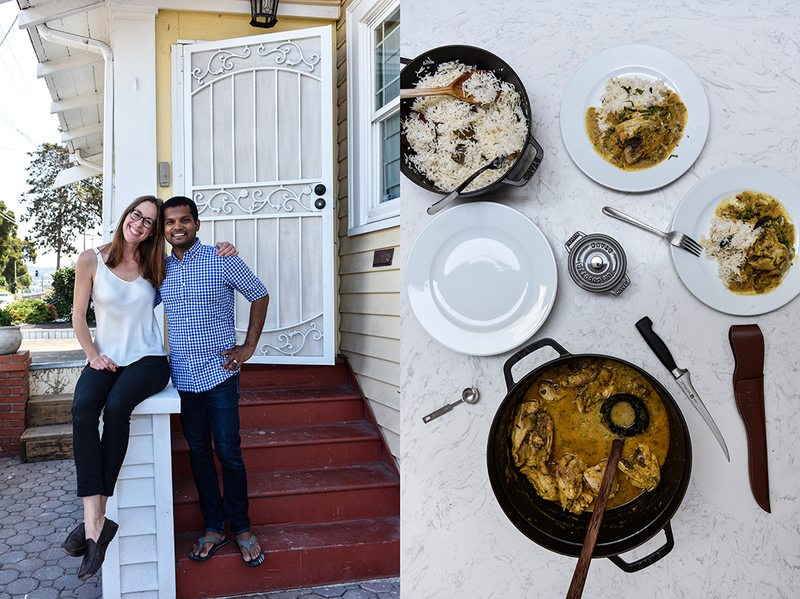 Every Sunday you can find one of Nik’s beautiful recipes in his A Brown Kitchen column printed in the San Francisco Chronicle (if you don’t happen to live in the Bay area you can also grab some inspiration online on the newspaper’s website) and on October 2nd, 2018, his first cookbook Season will come out. 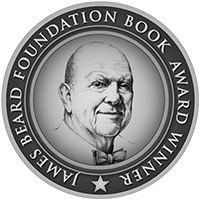 Reflecting Nik’s unique style, the book combines the author’s roots and fascination for flavors with his journey as an immigrant in the US who lived in different states and experienced the culinary heritage from people coming to this country from all over the world. 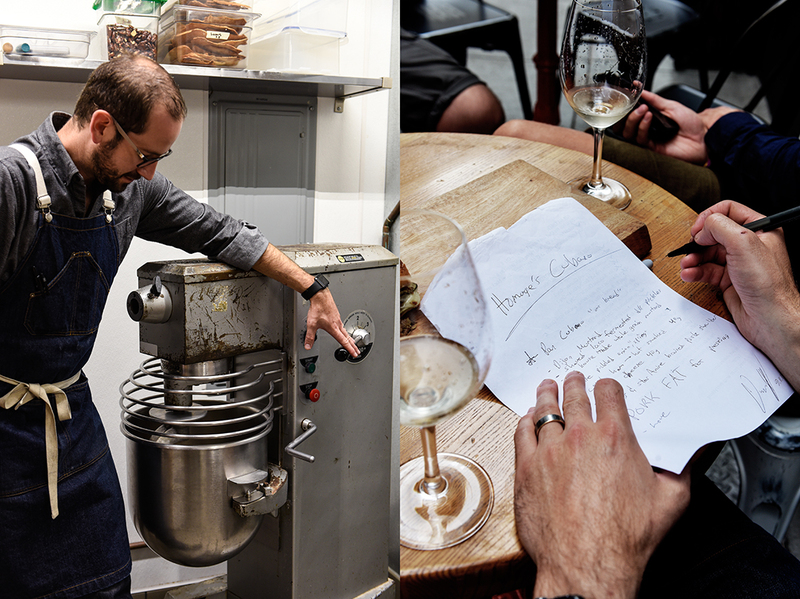 And if you also want to eat in Nik’s kitchen, check out his supper club! Cut one onion into thin slices and keep aside until ready to use. Take the second onion and cut it into quarters. Place coconut, water, ginger, turmeric, peppercorns, cayenne, cloves, cinnamon, and the quartered onion in a blender and pulse on high speed until smooth and combined. 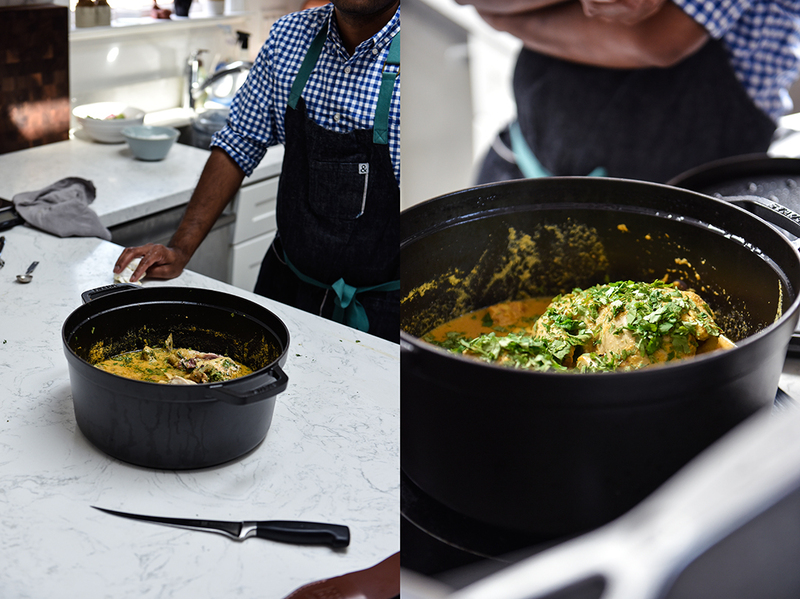 Melt the ghee in a medium-Dutch oven (or a heavy pot) on medium-high heat. Add the sliced onion and sauté until golden brown for about 8 to 12 minutes. Peel any extra paper off the garlic pods and trim about ½ inch (1 cm) off the top to expose the garlic. Add the trimmed garlic pods to the onion and cook for about 1 minute. Then add the ground coconut spice mixture into the pan and cook stirring occasionally for 2 minutes. Place the two Cornish game hens in the pan snuggly and fill the pan with enough water to just cover the two birds. 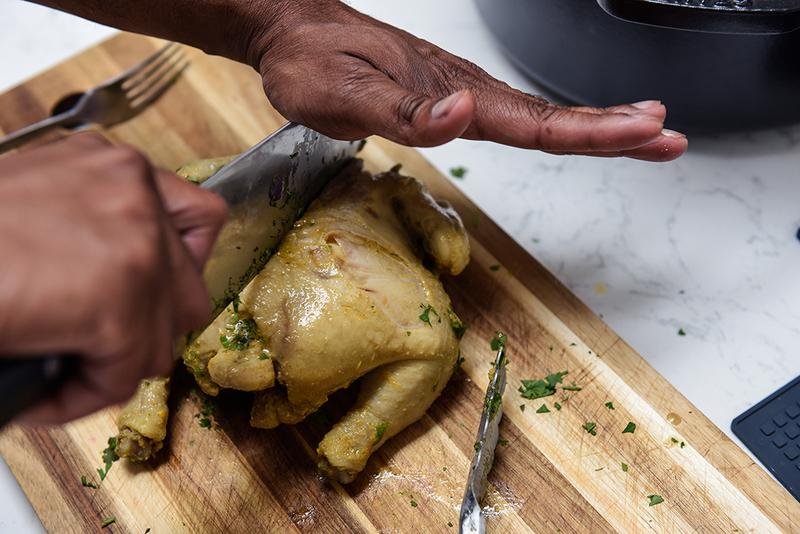 Increase the heat to high and bring the contents of the pan to a rolling boil, then reduce heat to medium-low, cover with a lid and allow to simmer for about 45 minutes to 1 hour until the birds are completely cooked and tender. Taste and adjust the seasoning with salt. Garnish with the chopped cilantro leaves and serve hot with rice or bread. A food loving friend of mine who lives in San Francisco told me, if you come to California, you must (!) 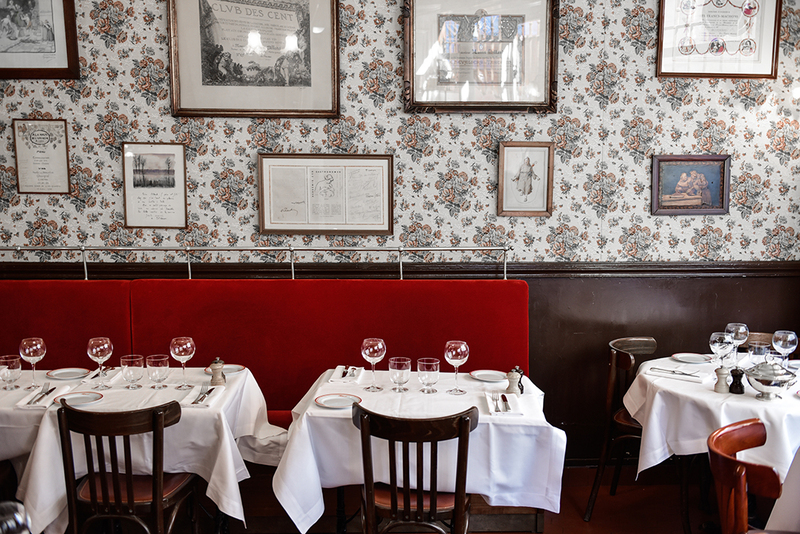 meet David Kurtz and visit his Homage restaurant in Downtown. I trust my friends, especially when it comes to food, so I emailed David that same evening, not only receiving an answer that he was looking forward to cooking with me, but also to showing me around his hometown and spending a day together to give me an insight into his charismatic city that has so many faces. 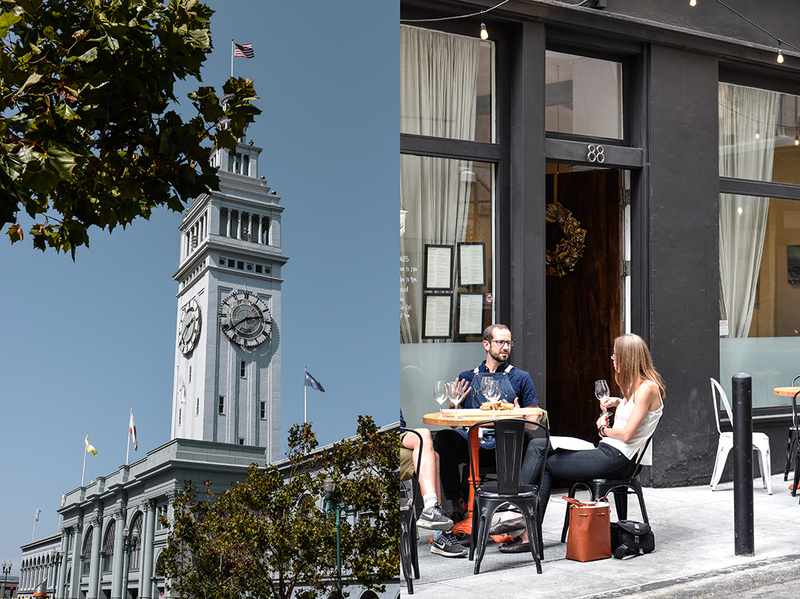 The first thing that people think of when it comes to San Francisco is the Golden Gate Bridge and – if you talk to bread obsessed foodies and Instagrammers – the famous Tartine Bakery. The bakery is a temple for baked goods that one shouldn’t miss, the bridge, however, is a moody diva that is hard to catch. San Francisco is a place of extremes when it comes to the weather, a fact that I had totally forgotten about and wasn’t really prepared for. You can be spoilt with blue skies, sunshine, and summery temperatures in one second, then walk two blocks and be swallowed by mist and end up shivering in the cold. It was a bright afternoon as we drove to the famous bridge, impatient excitement in our faces ready to capture its majestic elegance, yet to find ourselves fighting against thunder and rain as we arrived was sobering. 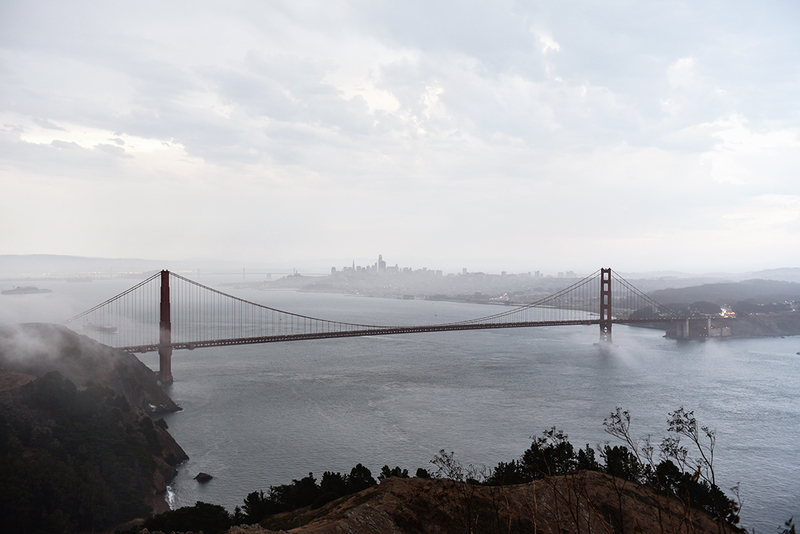 Needless to say there was no bridge in sight, but seeing the clouds climbing the hills behind the bridge and filling the bay with darkness and lightning faster than one can run was just as impressive. 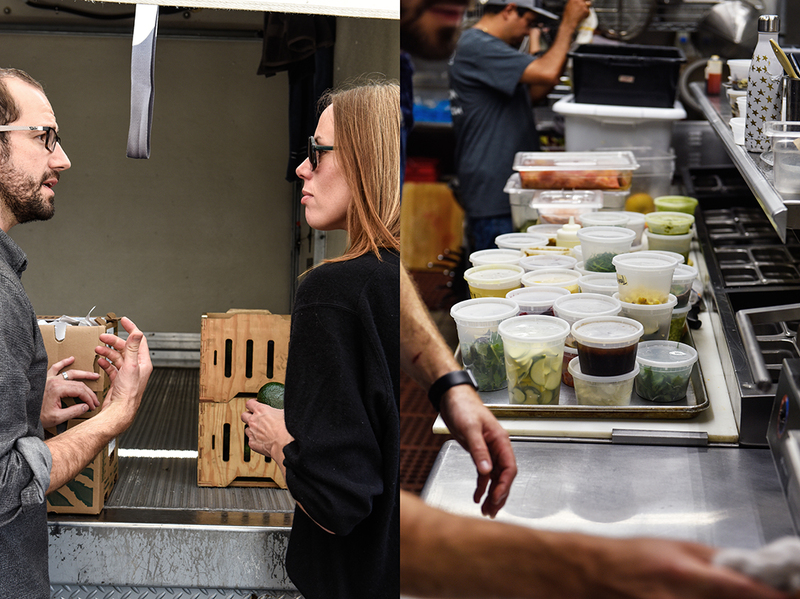 The day we met David offered this exact spectrum of experiences, in food, weather, and sceneries. 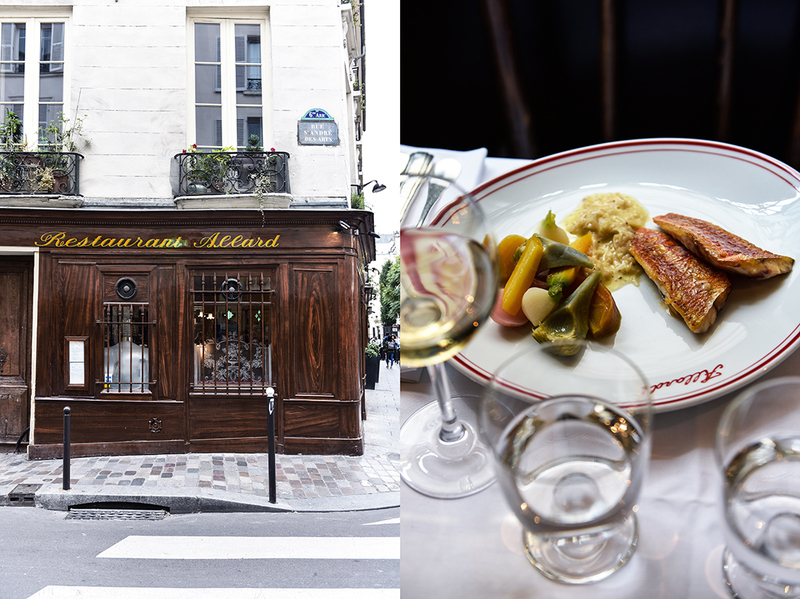 We started at the chef’s wonderfully relaxed, casual, yet elegant Homage restaurant, a culinary gem tucked in a little side road surrounded by high office buildings. It’s a tranquil oasis in the center of the vibrating buzz of this city. 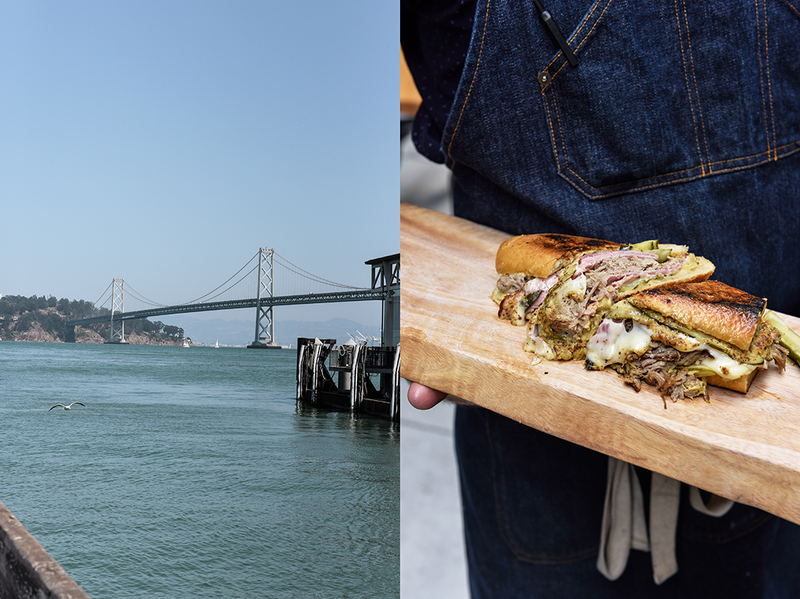 Sitting outside at one of the bistro tables, with a glass of Californian wine in my hand and a scrumptiously dripping sandwich on a chopping board right in front of me, was one of the best memories that I took home with me from this trip. 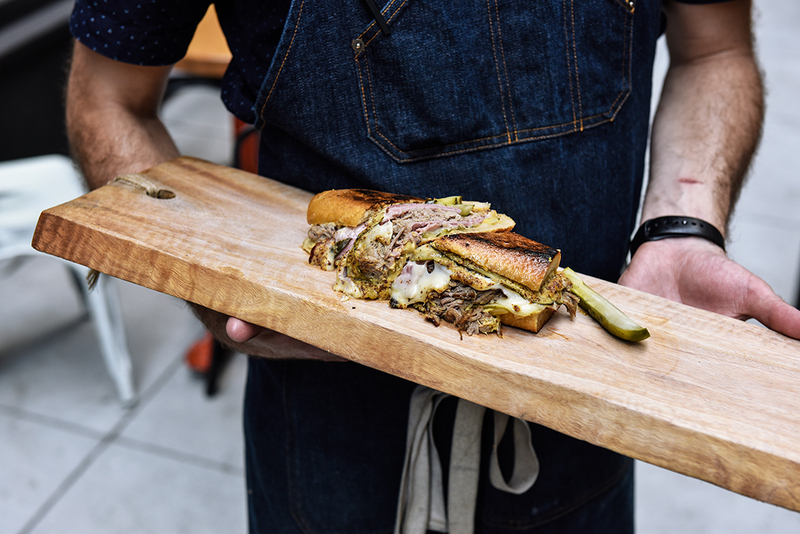 This sandwich, the Cubano, is truly addictive and so famous that, according to David, it would cause a riot if he ever dared to take it off the menu. 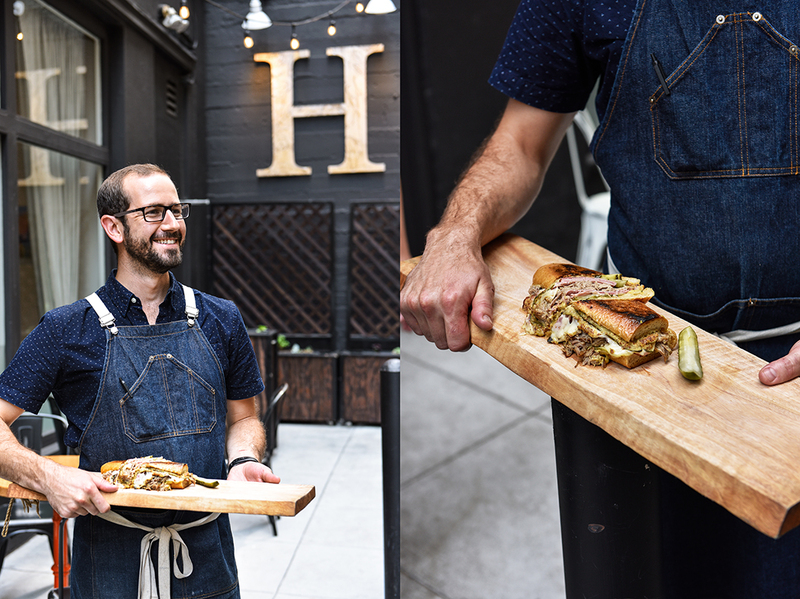 Imagine the best homemade baguette brushed and grilled in tasty pork fat (homemade lard), filled with succulent anise braised pork shoulder, hot smoked ham, Swiss cheese, mustard, dill pickles, and even more pork fat. It’s the best sandwich I ever had in my life. Tomatoes kissed by the sun in all shapes, sizes, and colors; a sea of polished peppers; fragrant bundles of cilantro, basil, bay leaves, mint, and purslane; farmers’ stands specialized in beans (like Romano and Cranberry Beans), or figs, 8 or 10 different kinds of figs gently laid out in baskets, or a stand putting the spotlight on plums, peaches, and nectarines, run by a woman with the sweetest smile, Aomboon Deasy. 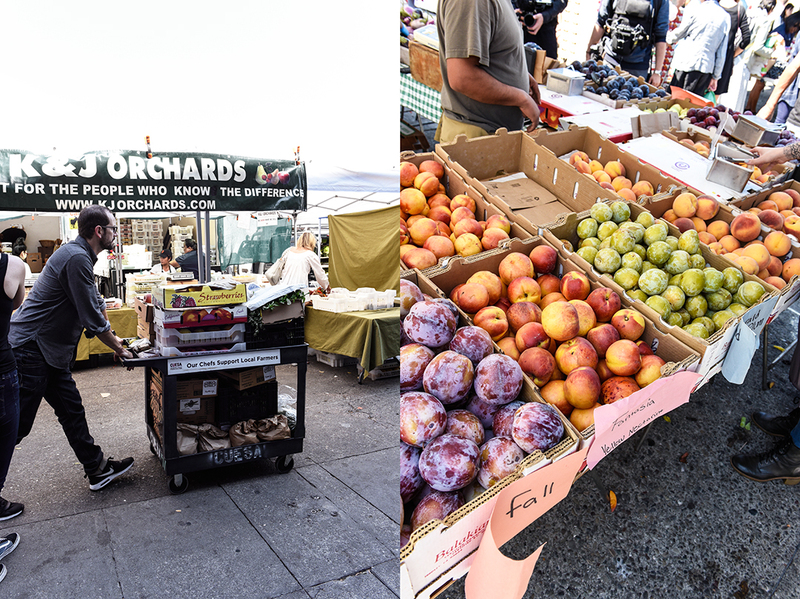 Each person, each stand at the market focuses on the prettiest crisp fruits and vegetables, celebrating its taste and beauty. One stand in particular left me in an awe: piles of Baby Curly Kale, Red Russian and Dino Kale, green and red dandelion, each leaf packed with so much pungent flavor that you want to nibble them straight out of the baskets (which we did). 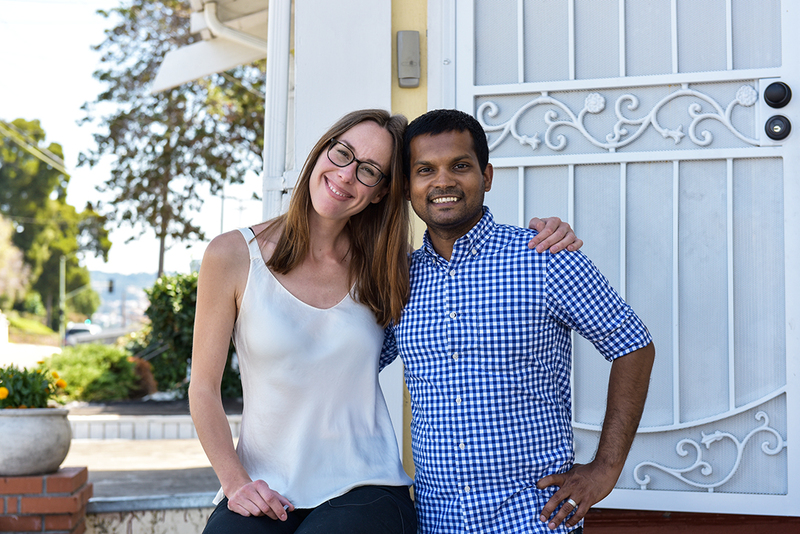 I found the perfect partner for my market visit, David and I love food so much so that when Anja gave me a beautiful flower bouquet at the market, both David and I started eating the petals. Like I said, when he tells me in his trustful voice “Meike, you can eat this”, I’ll eat it! But apart from flowers and greens, I also tried the crunchiest spicy kimchi, candy-sweet September strawberries (a luxury for a German girl who’s used to a rather short season of this fruit in her own country), ripe dates right off the vine, and the Rebel Within, a savory muffin filled with a soft boiled egg, sausage, Asiago cheese, and spring onions. It was heaven. After the ‘hard work’ at the market and in the kitchen, we spoilt ourselves with a little feast at Nopalito, David’s favorite Mexican restaurant. They cook delicious organic classics, like ceviche verde, enchiladas de mole con pollo (shredded tender chicken in a deep rich chocolaty sauce), and grilled fish tacos, all washed down with Michelada, Mexican beer with tomato, jalapeno, orange, lime, and salt – which was quite an experience. 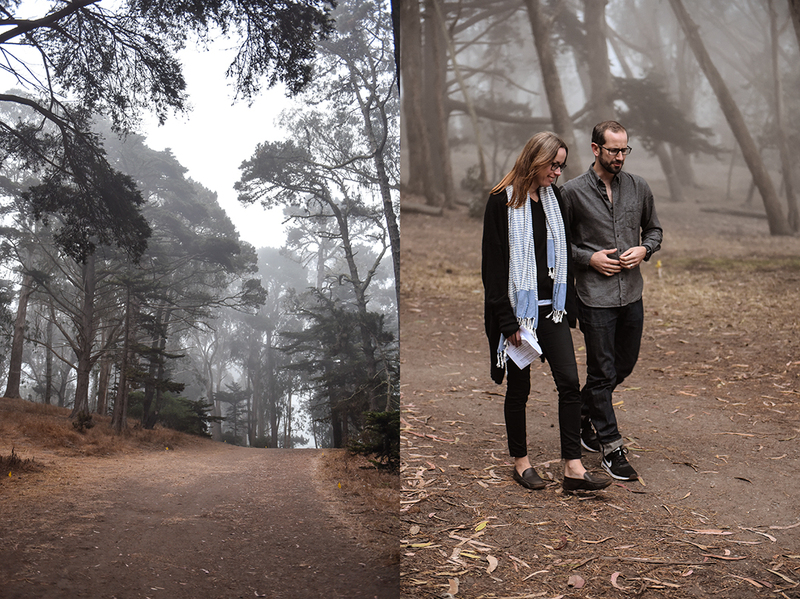 And after the meal we went for a walk at Golden Gate Park, where we were supposed to forage for forest snacks that one can find in a city if you keep your eyes open, but we chatted the time away. 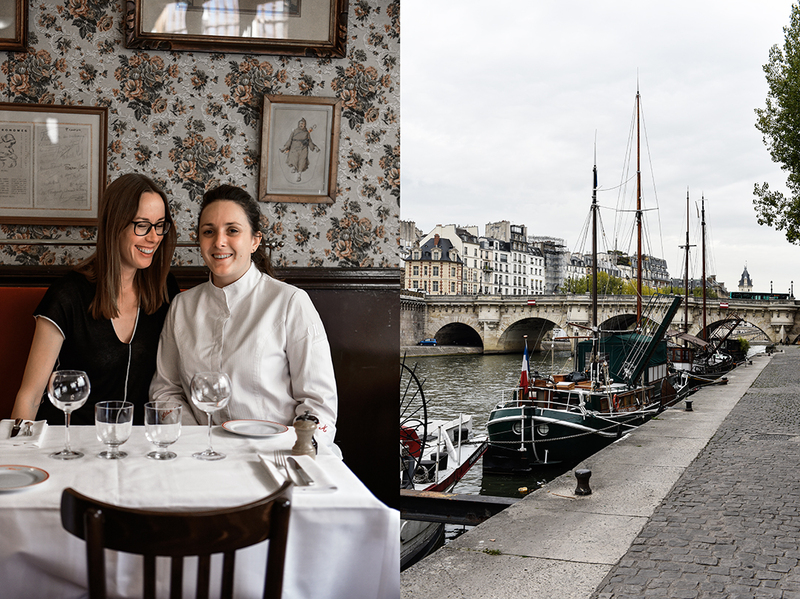 Wrapped in dense mist hanging heavily in the air, I was amazed by the beauty of the ever changing weather and the surprising scenes that it causes, and by David’s philosophy and thoughts about the food that he celebrates at his restaurant. 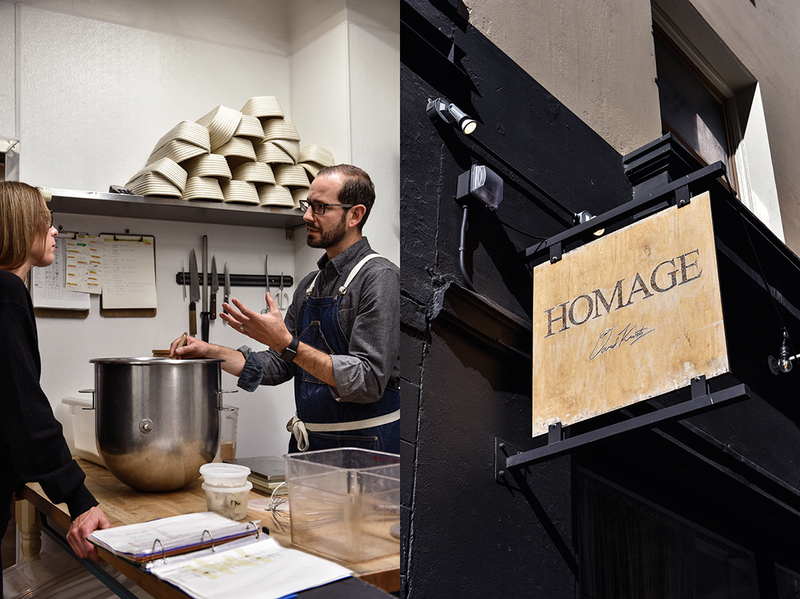 Homage is a very, very special place that I’ll always go back to when I’m in San Francisco, because of David and Anja, because of the food that’s created and put together by the chef and his team with so much love and attention to detail in every single ingredient, because of this warm atmosphere that welcomes you as soon as you open the heavy door flanked by the restaurant’s black facade, an atmosphere that makes you never want to leave again. 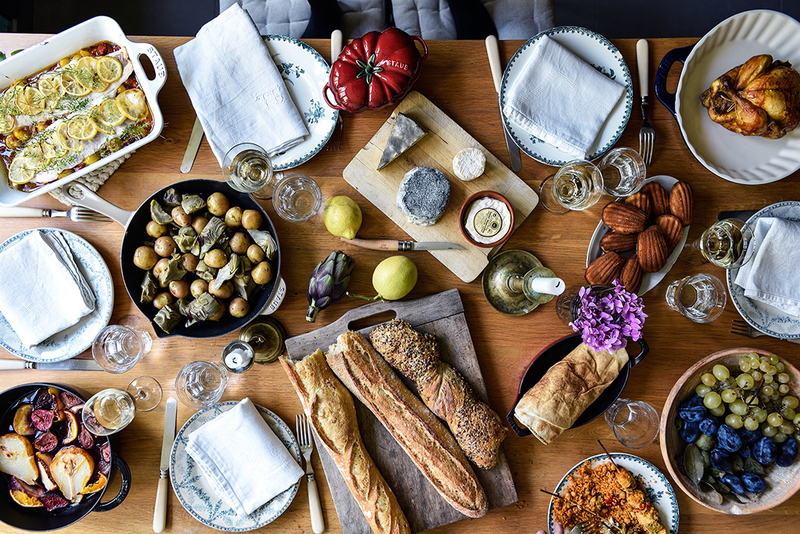 And if you want to take a piece of it with you, you can grab a jar of the homemade pickles, jams, or a bottle of the wines and beers brought to Homage by David’s friends, a bunch of people who find satisfaction in creating products of outstanding quality, just like David. And thanks to them we enjoy treats that taste so good – maybe because of the last ingredient that David listed in the recipe for his Cubano sandwich that he gave me: Love. David mills the grains for the flour that he uses for this recipe himself, however you can also use store-bought flour. It’s recommended to work with grams instead of cups, as it’s important to use precise measurements for this recipe. In a large bowl of a stand mixer, using a fork, combine the water, honey and yeast, let it sit for a couple minutes. In a large bowl, combine all the flours, add to the yeast mixture and, using the hook, mix for a few minutes or until well combined. Add the lard and, using the hook, continue kneading for a few minutes or until the dough has come together. Add a little more flour if it’s too sticky or, if it’s too firm, add a little (!) more water. Add the salt and continue kneading until well combined and firm. Form a ball, place in a clean bowl, and cover with a damp towel. Let the dough sit in a warm place for 1 hour. Turn the dough completely over releasing built up CO2 and let rise again for another hour, covered with a damp towel. Punch the dough down, take it out of the bowl, and divide equally into 3 pieces. Roll into smooth balls and let bench rest for 10 minutes under a damp cloth. When fully rested, take one piece of dough and stretch and pull it into a longish rectangular shape (about 14×5.5″ / 35x14cm). Carefully flip 1 long side over until it reaches the middle of the rectangle, mind that no air is trapped in the fold. Then flip the opposite long side over, so that you end up with 3 layers of dough folded on top of each other. Using your fingers, pinch the fold all the way to seal well. 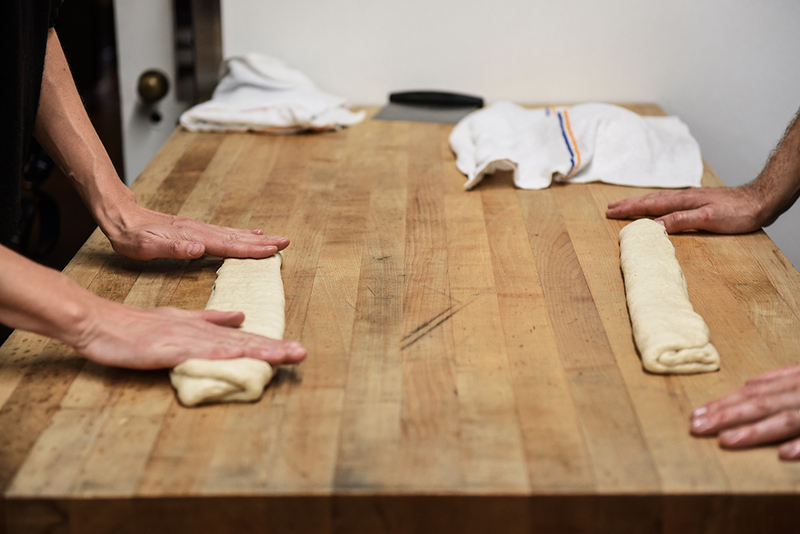 Gently roll the dough into a long, thin sausage shape, then carefully, but quickly transfer to the lined baking sheet (the pinched fold should be on the bottom side). Continue forming the remaining 2 baguettes and transfer to the lined baking sheet. Cover with a damp kitchen towel, transfer the baking sheet to the fridge, and let the baguettes rest in the fridge overnight, further developing flavor and retarding the yeast activity. Preheat the oven to 350°F / 175°C (convection setting). Take the baguettes out of the fridge when the oven is hot and ready. Spray the baguettes with a little water and bake for 6-12 minutes or until the crust is golden, spraying them with water once or twice while baking. Internal temperature of the bread should be 210°F / 100°C when fully baked. Heat two heavy pans, preferably cast iron, over medium-high heat. Spread the inside of the baguette with Dijon and whole grain mustard. Lay the ham on the bottom and topside of the opened baguette. Arrange the cheese, spring onions, and pickles on top of the ham. Spread the braised pork shoulder on top and close the baguette. Brush one pre heated pan with fresh lard, carefully place the Cubano onto the pan’s surface and brush more lard onto the top of the baguette. 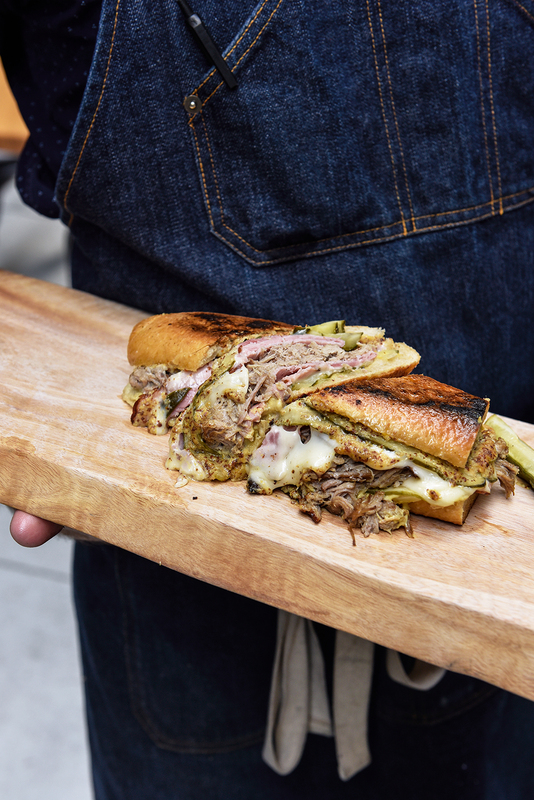 Squeeze, or press the Cubano with the other preheated pan directly on top of the sandwich. Cook in the pan, on medium heat, turning once, for a few minutes or until the cheese has melted and the crust of the bread is golden brown and crunchy. Prepare with love and serve immediately with a large sliced pickle.